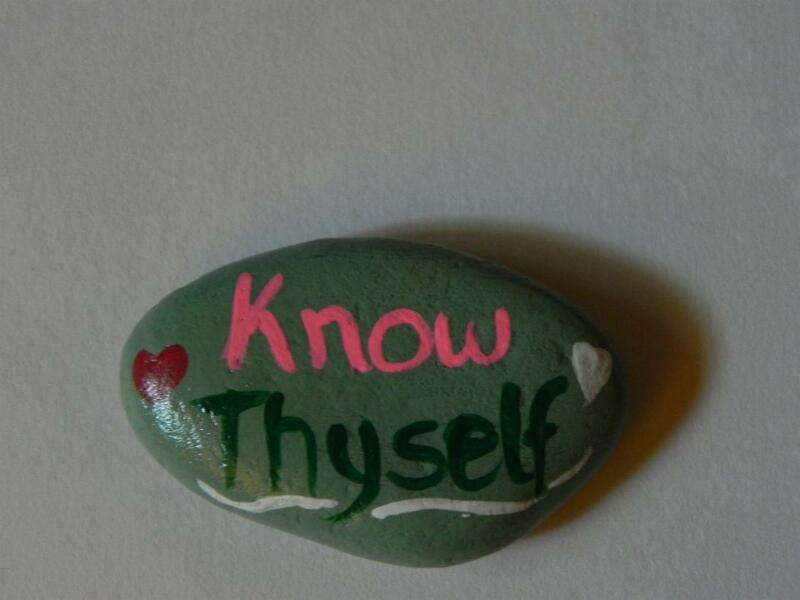 When you hold a stone or a small rock in your hands, you are holding a piece of the Earth, formed by the elements. 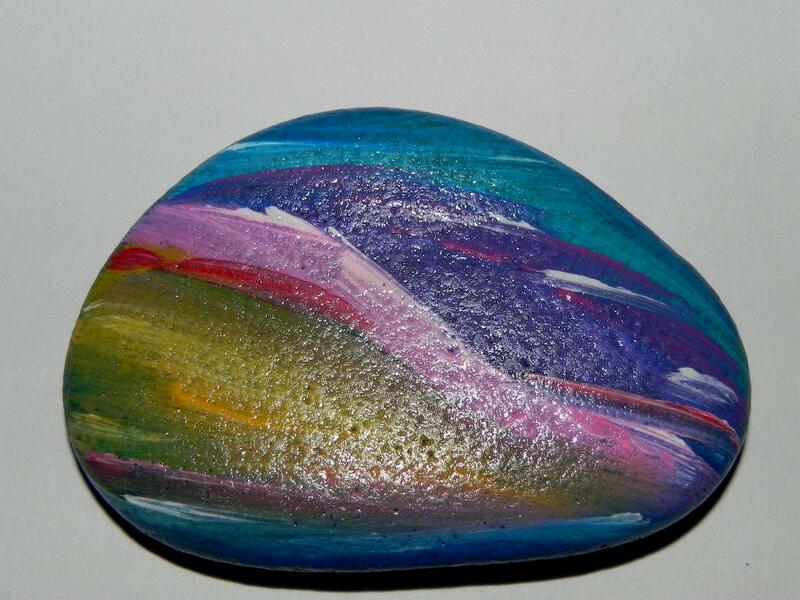 It has vibrations and is a direct connection to the Earth. Prayer stones go back thousands of years and are still used today. 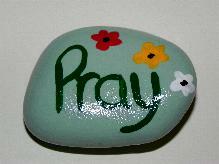 People leave stones at gravesites as a mark of remembrance; pile stones in little prayer piles; keep a prayer stone in a pocket, and hold and turn prayer beads in their fingers. 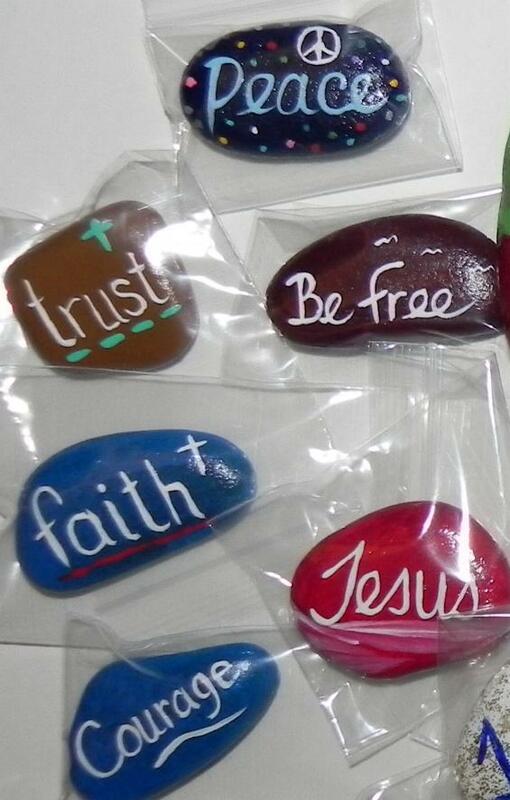 Think rosary beads (stones) or worry beads. 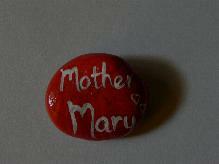 All are connections to Mother Earth. People have used gravestones or rocks to commemorate loved ones for eons. 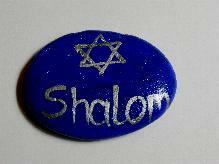 You can hold your prayer stone in your hand as you contemplate your prayer and it may give you comfort. Many people need something to hold onto when talking in prayer, and something from the Earth is a direct connection to the rest of the Universe. Whether you say a prayer, offer a blessing, request help or ask for guidance or forgiveness, using a prayer stone is nothing new. 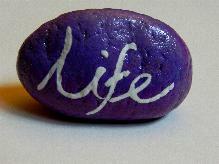 And the size of the stone or rock makes no difference; it’s what a stone means to you, regardless of how big or small it is. 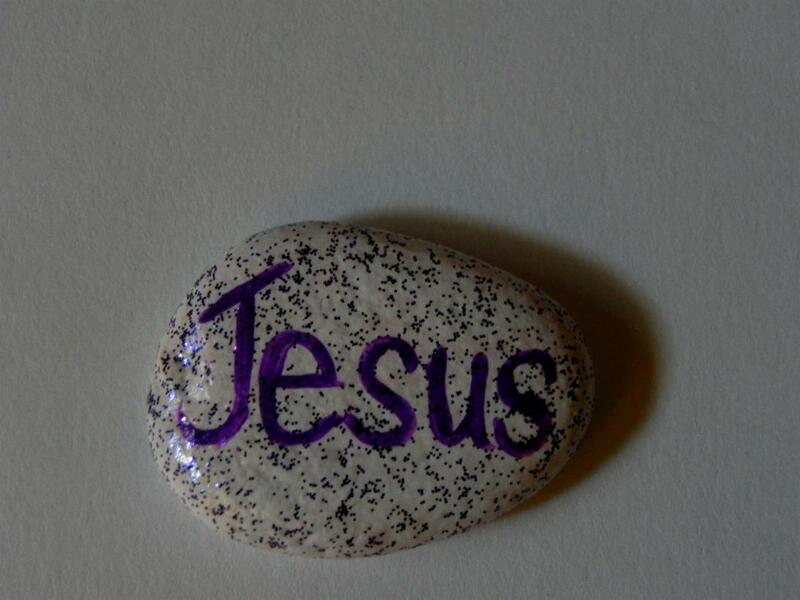 Look at the Wailing Wall in Jerusalem, or the giant cliffs where ancient people have etched figures or symbols, or the tiny stone beads used on a rosary. 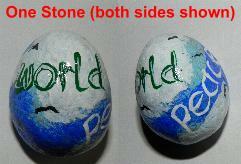 It really makes no difference, which is why you can choose whatever stone appeals to you and your beliefs. The Earth belongs to all of us. 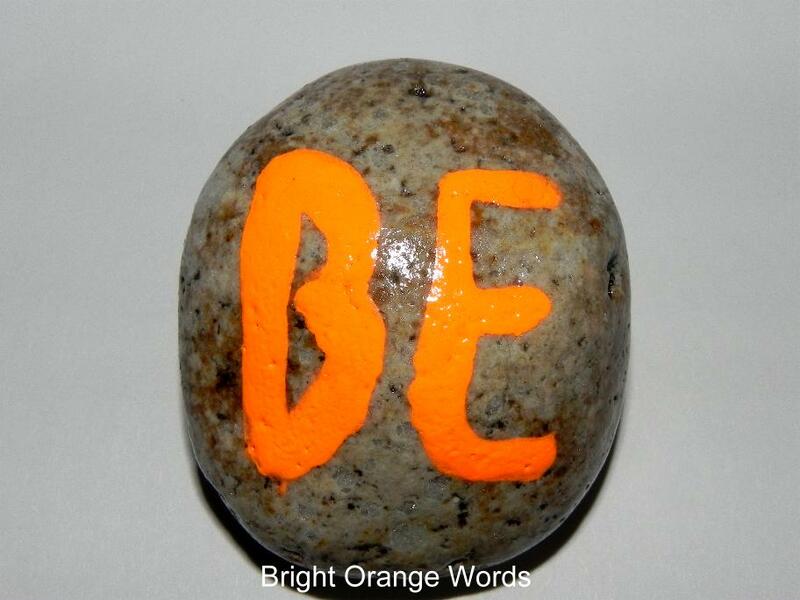 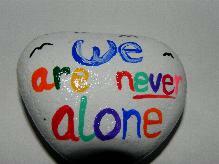 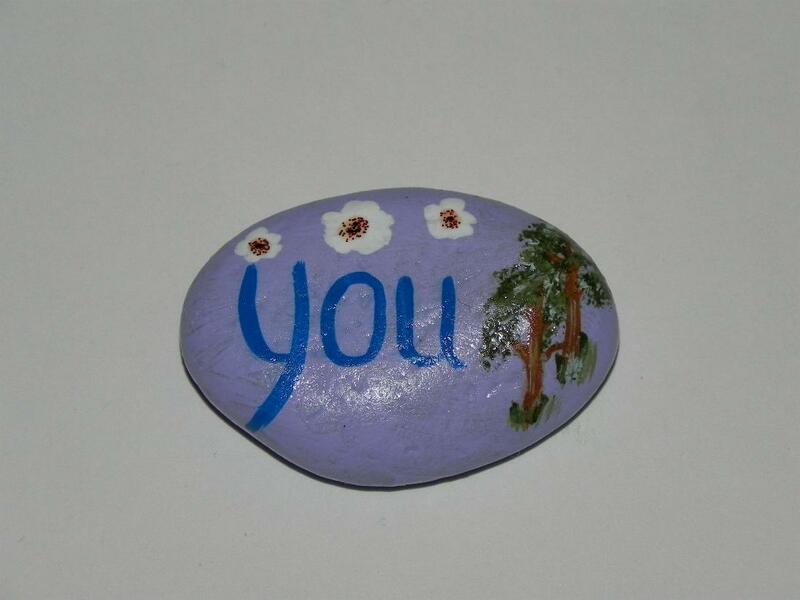 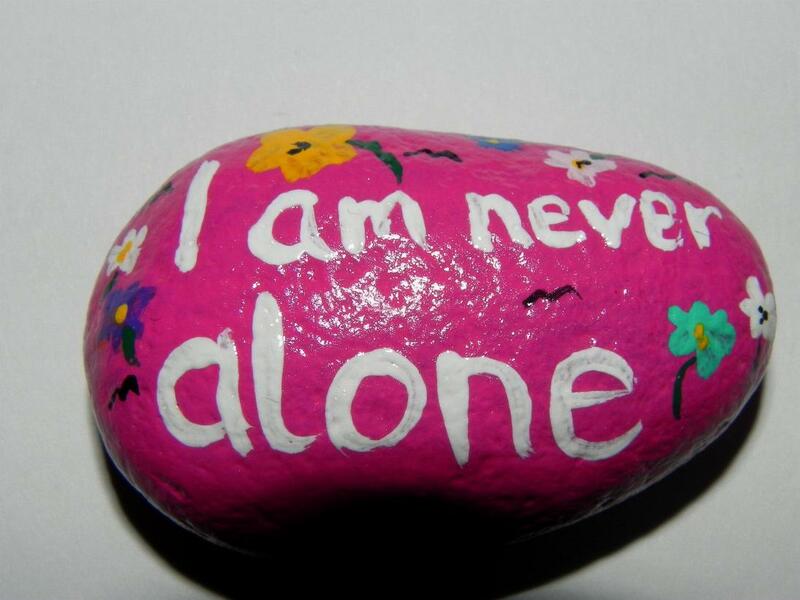 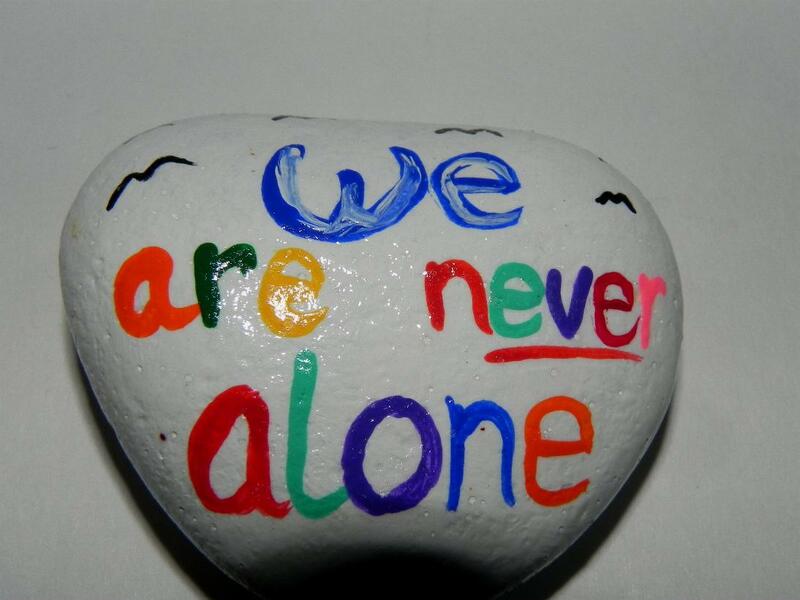 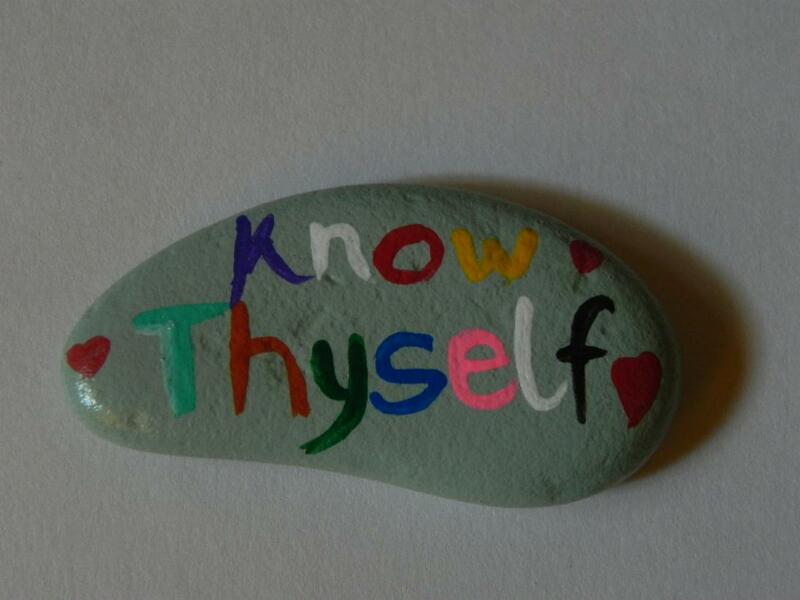 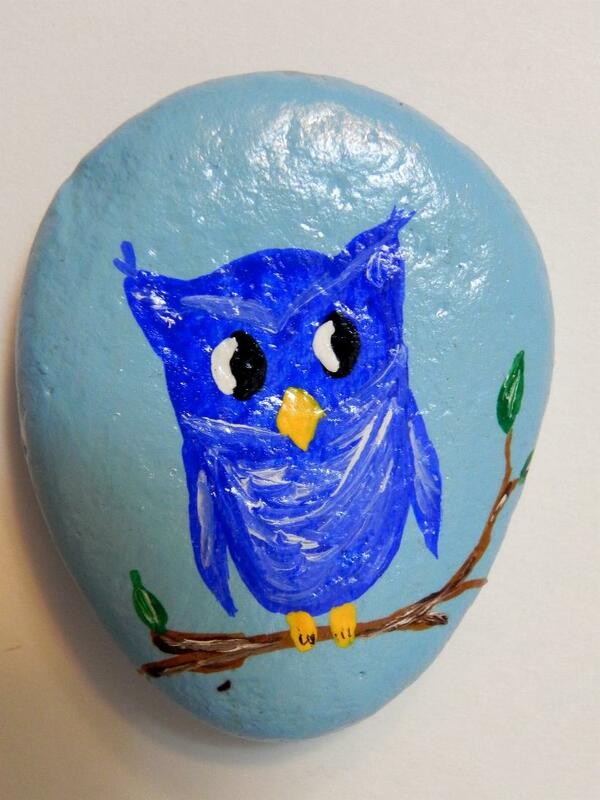 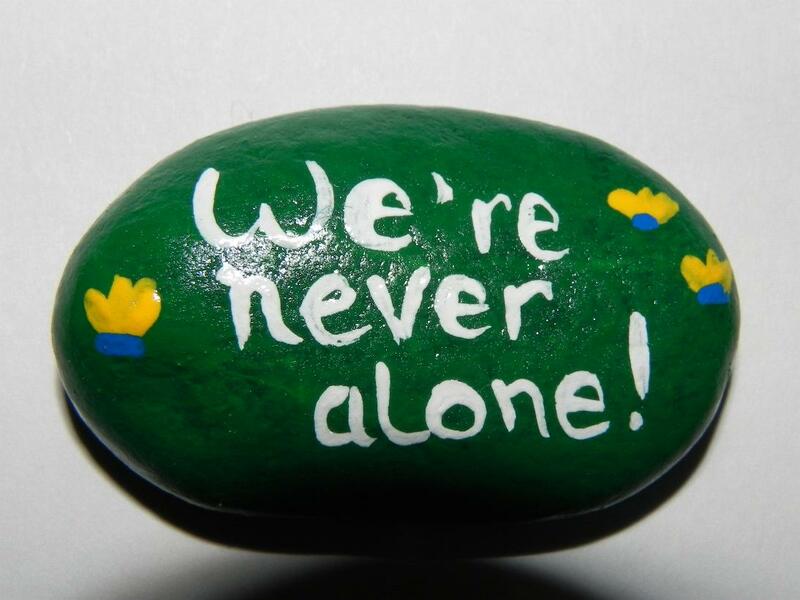 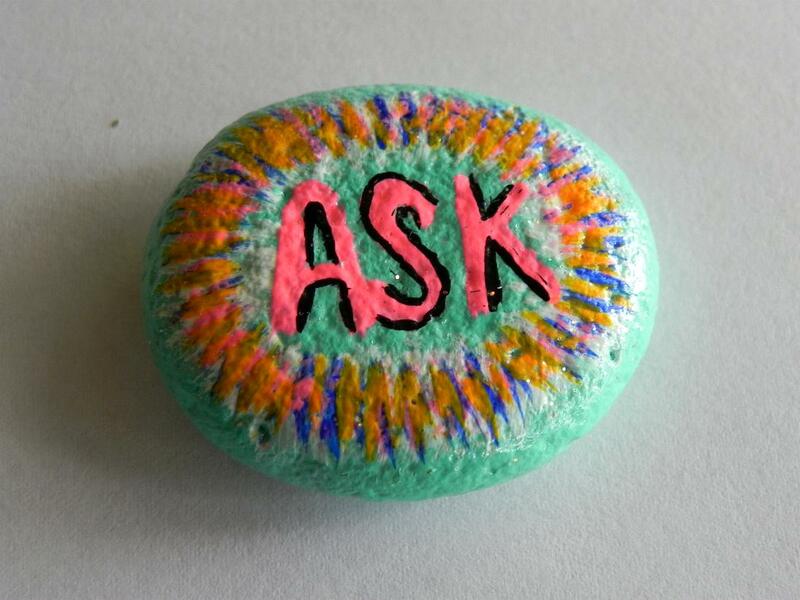 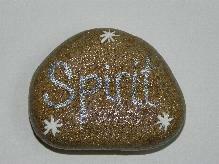 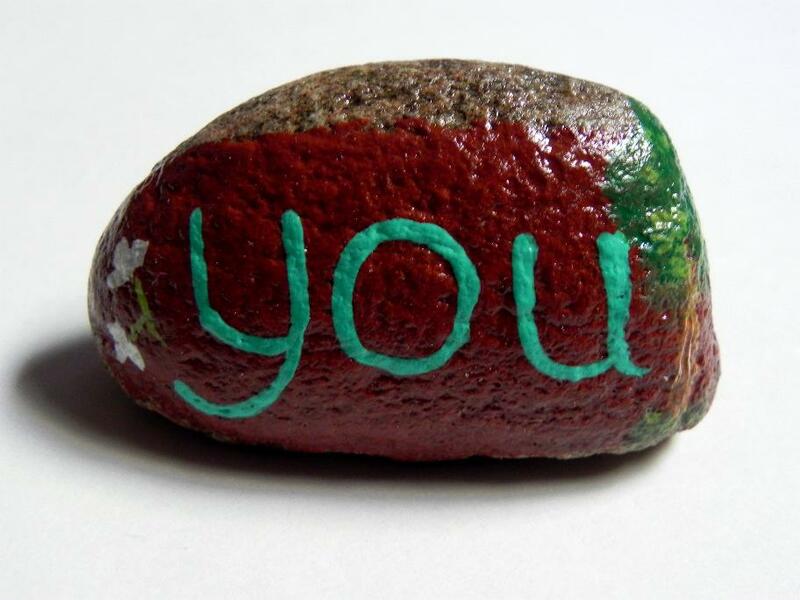 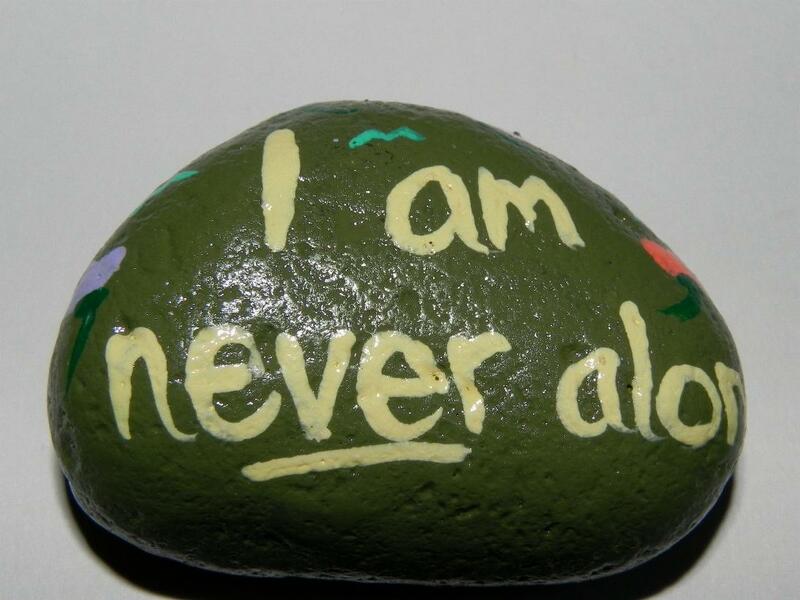 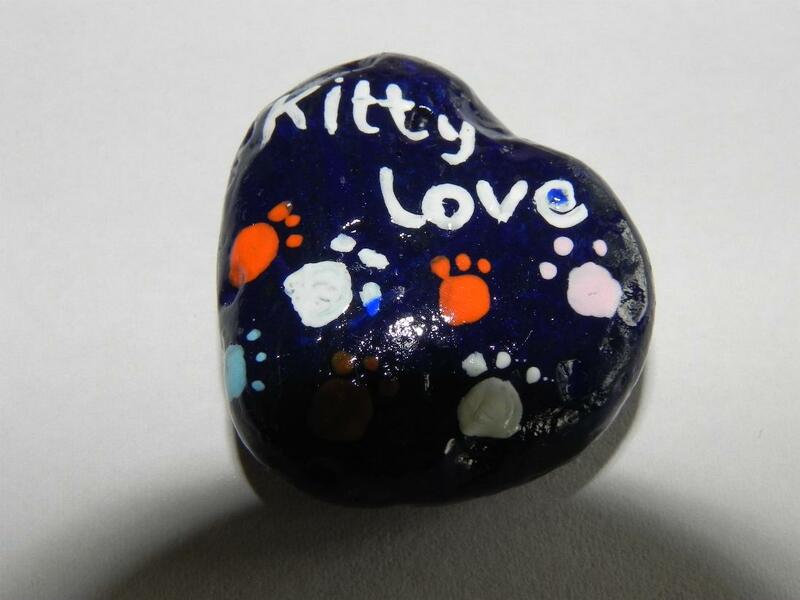 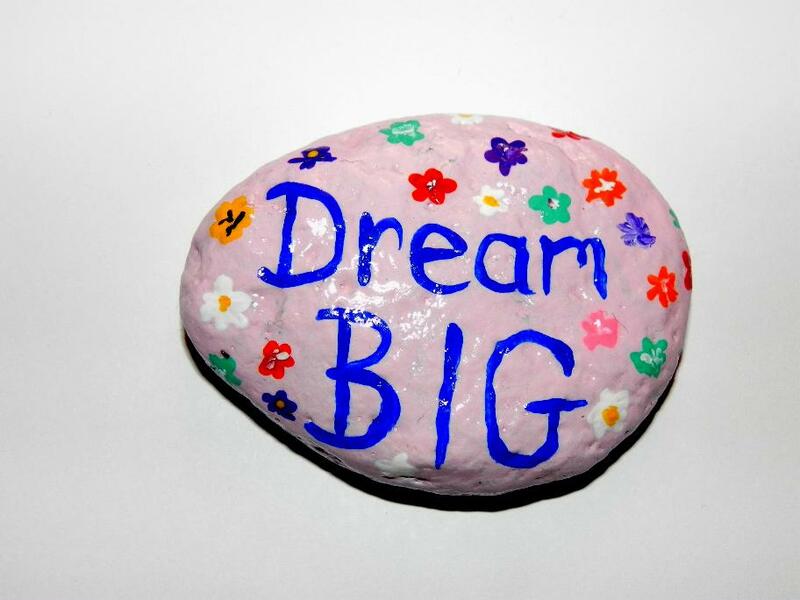 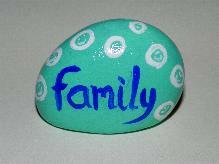 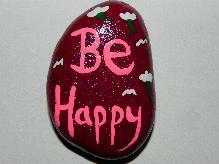 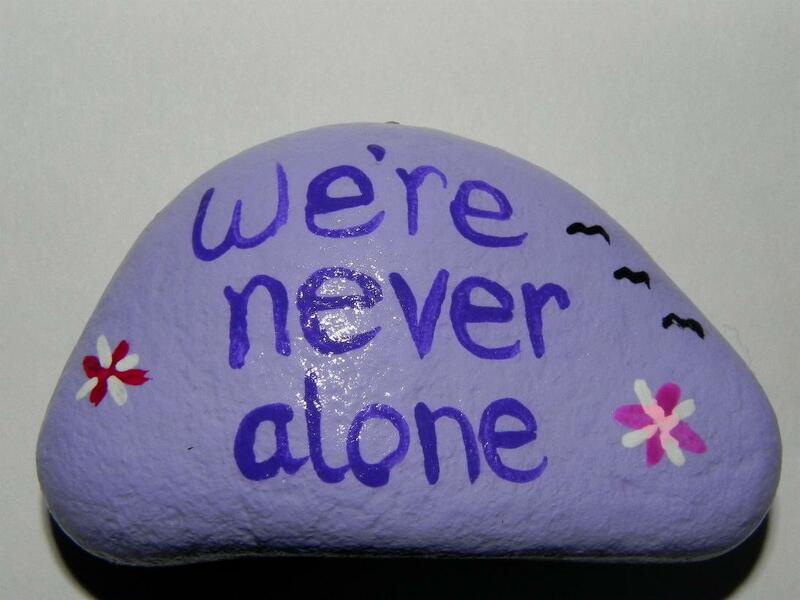 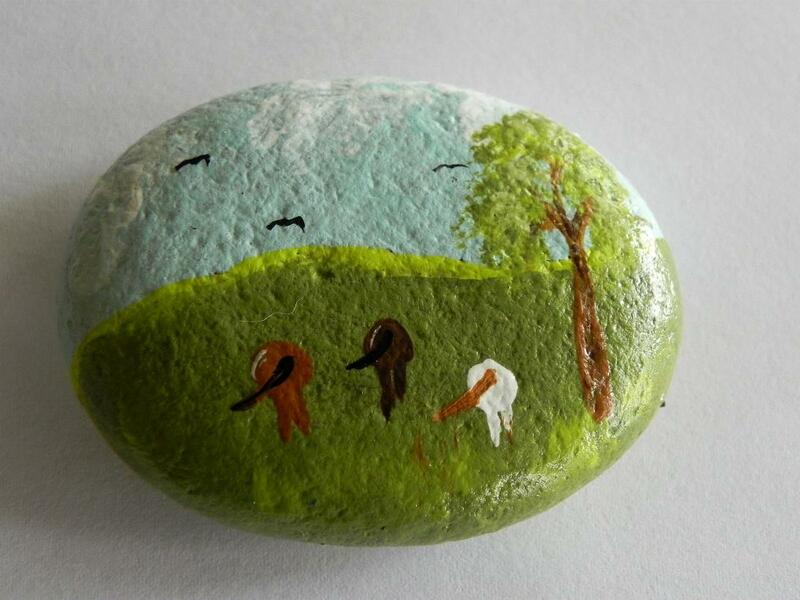 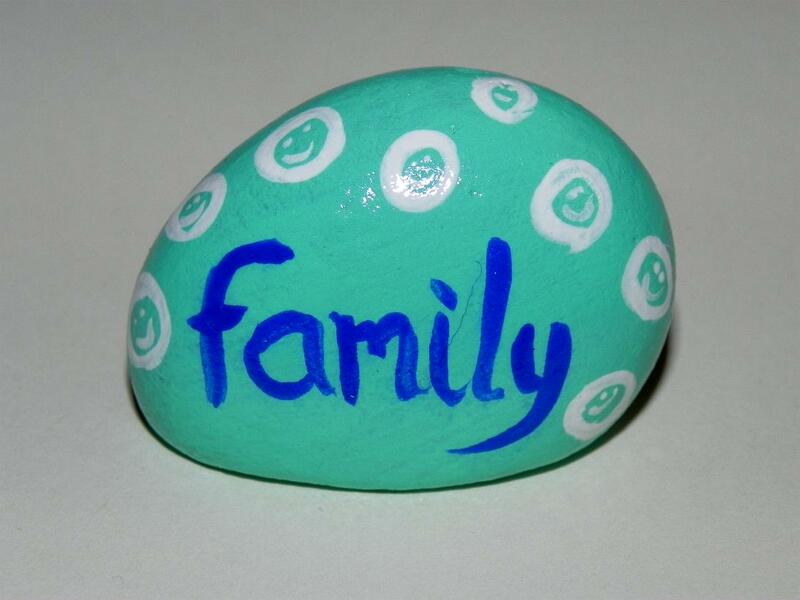 The stones I use to paint simple pictures and words on were acquired personally, and I believe, made themselves known to me. 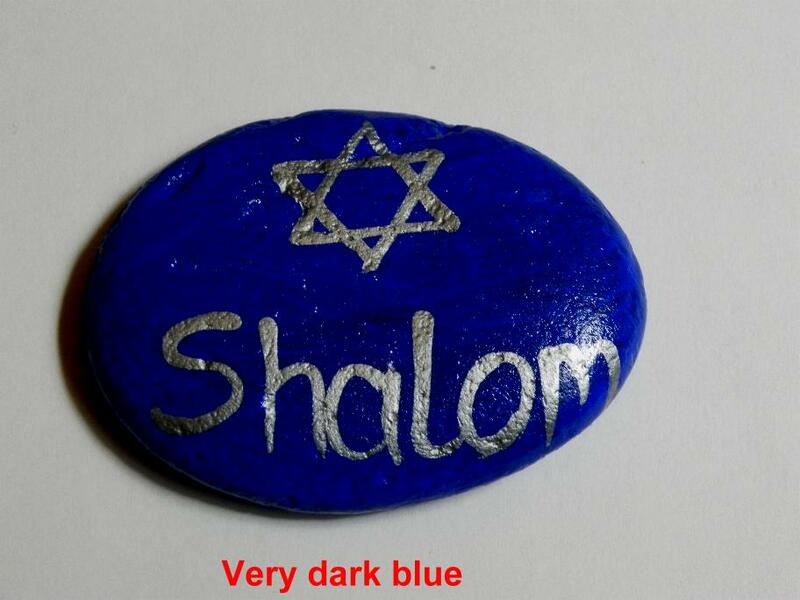 Some were “found” near where I live, some from high up a mountain, others in places I never thought I would be looking for stones. 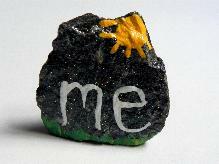 In essence, they found me. 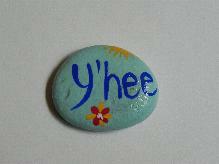 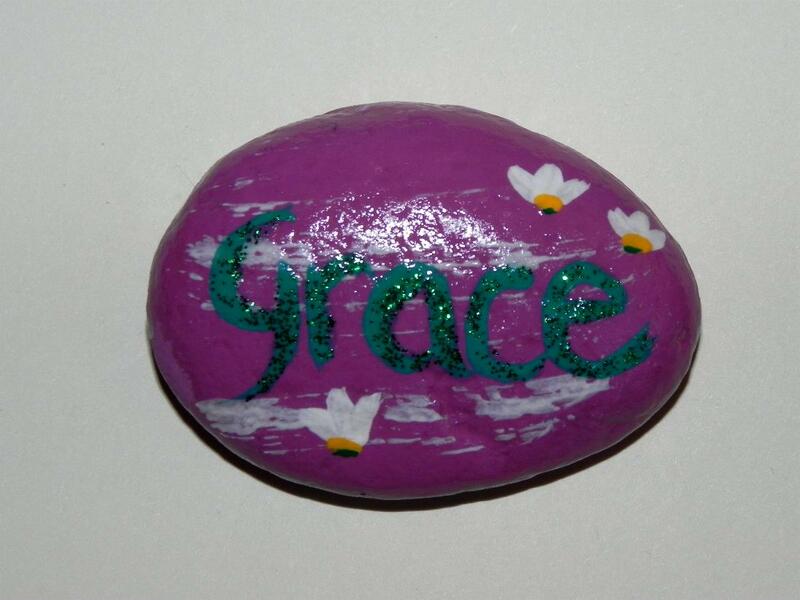 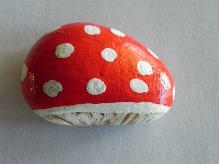 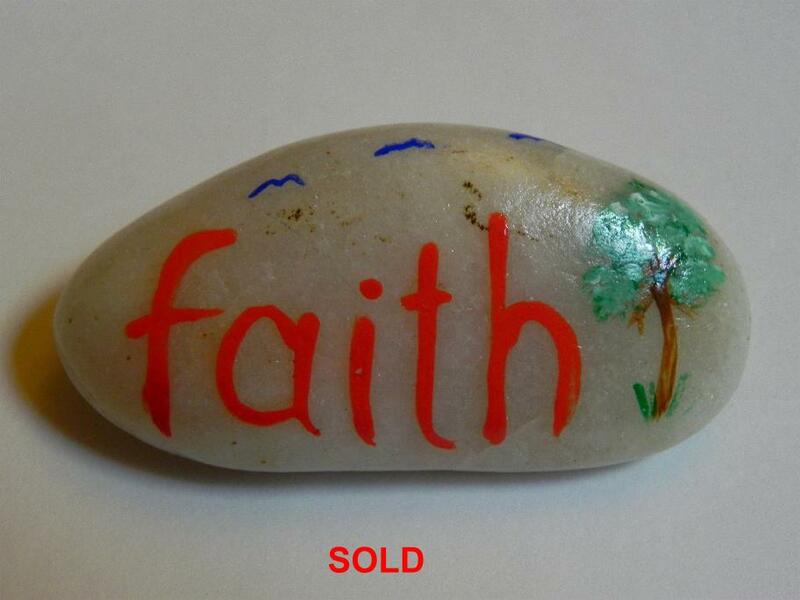 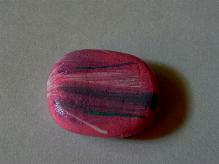 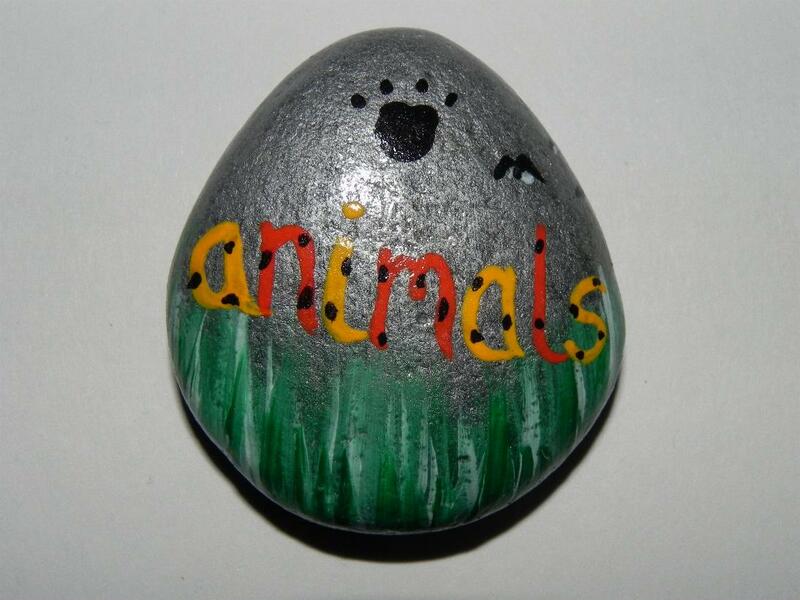 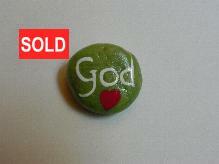 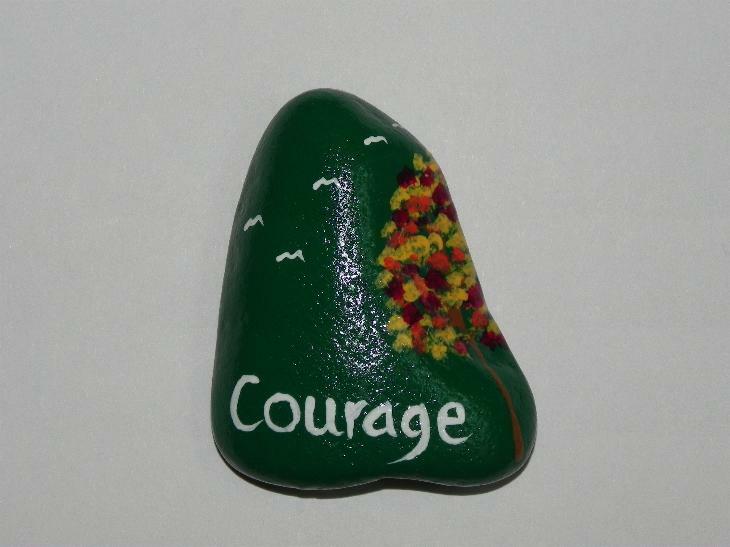 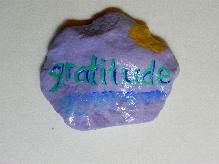 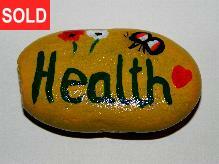 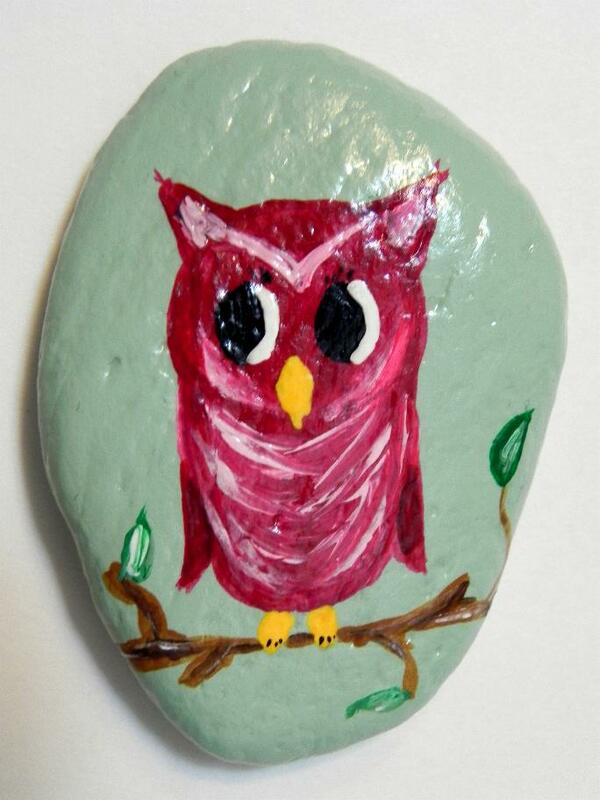 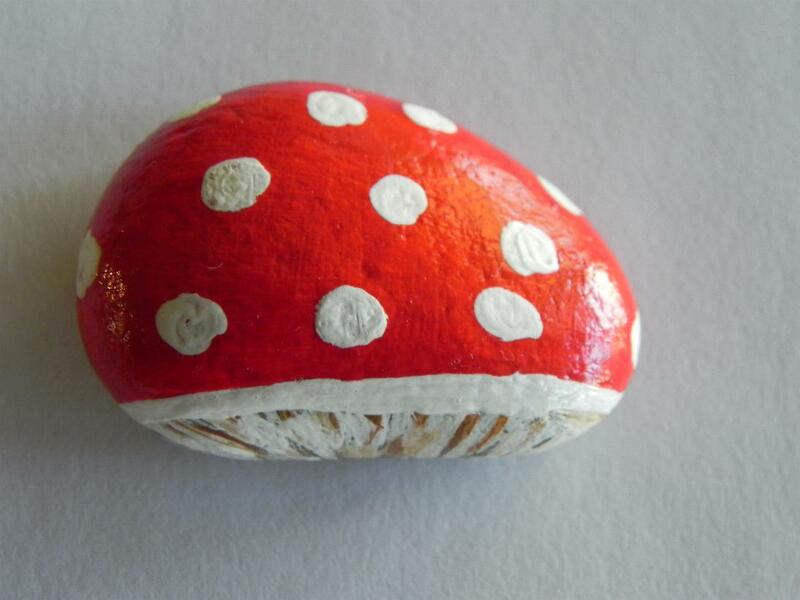 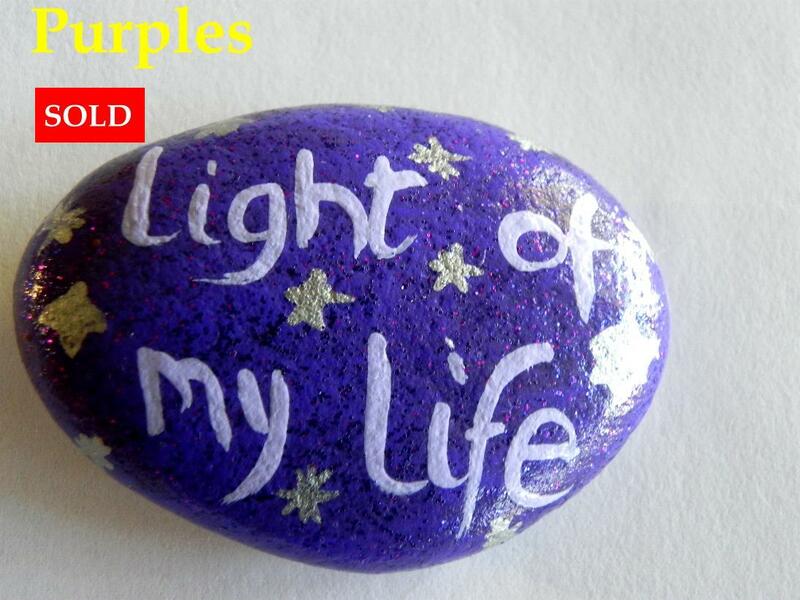 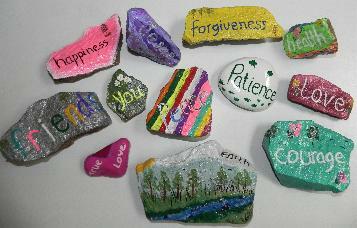 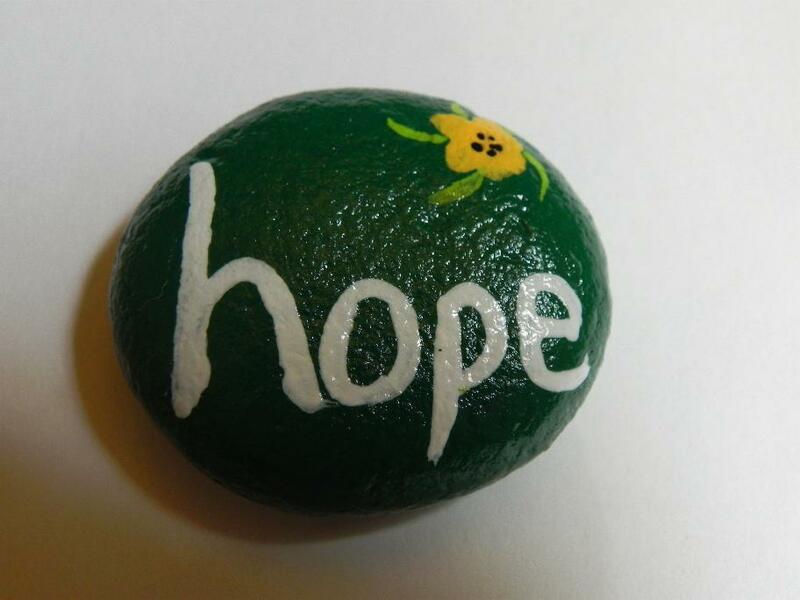 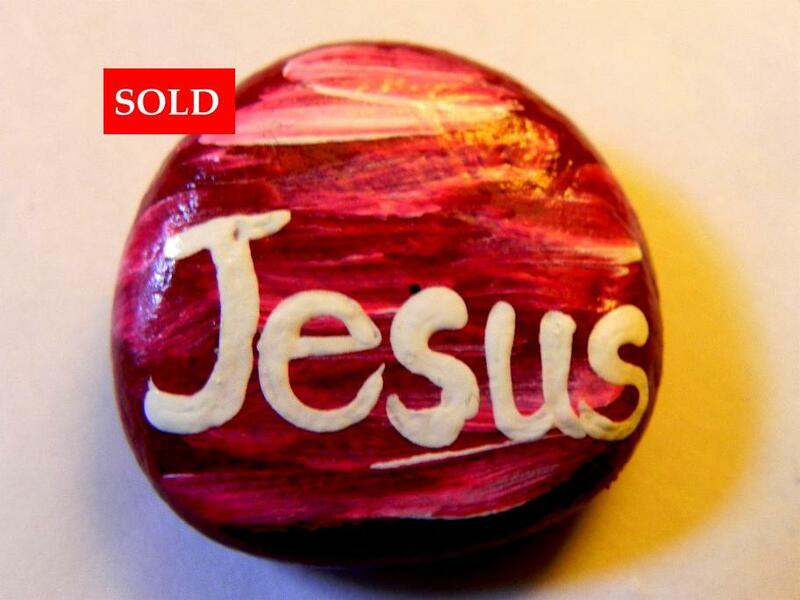 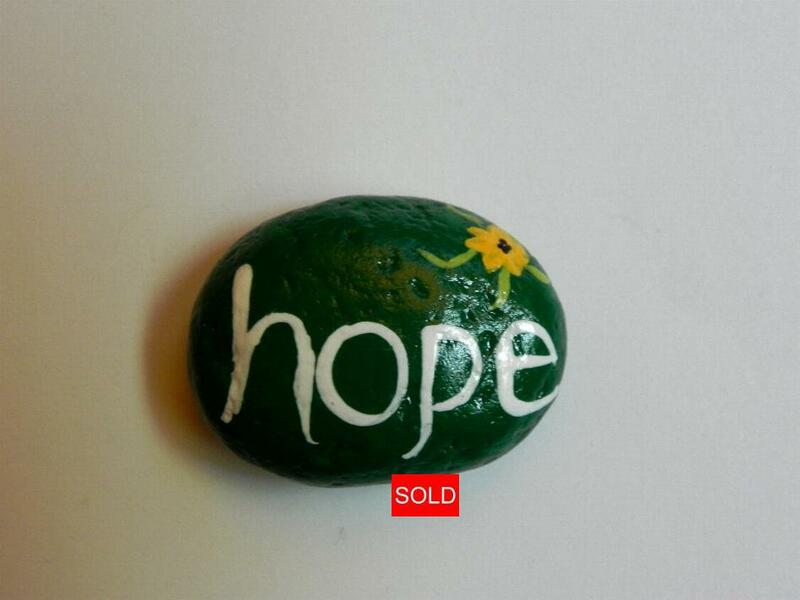 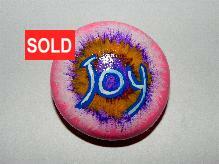 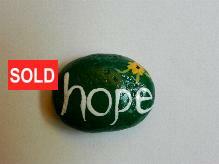 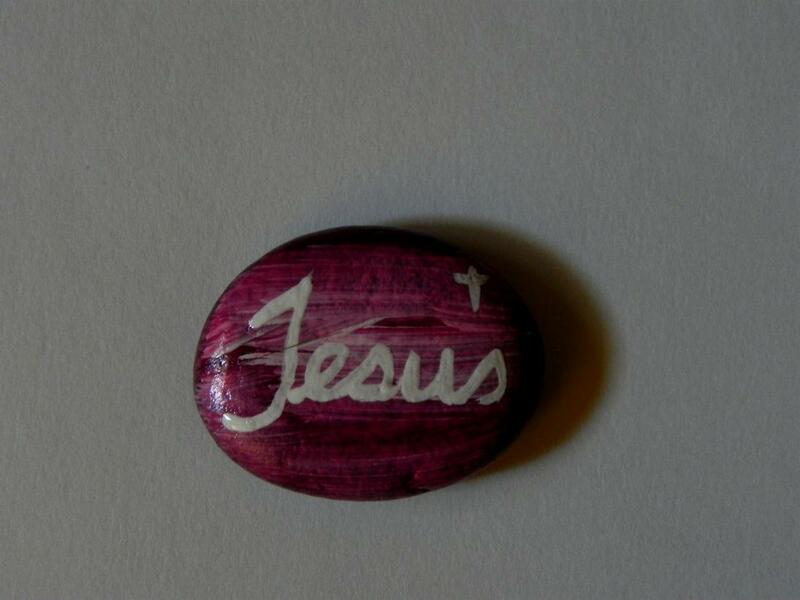 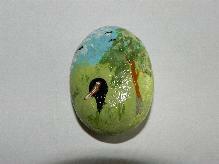 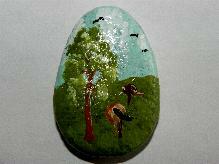 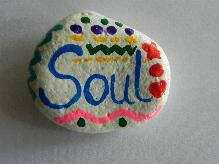 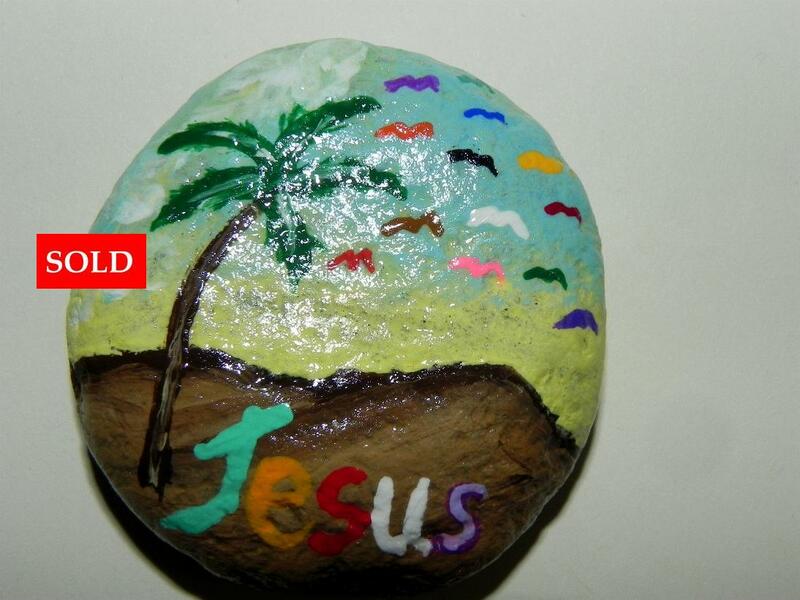 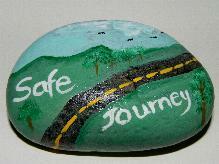 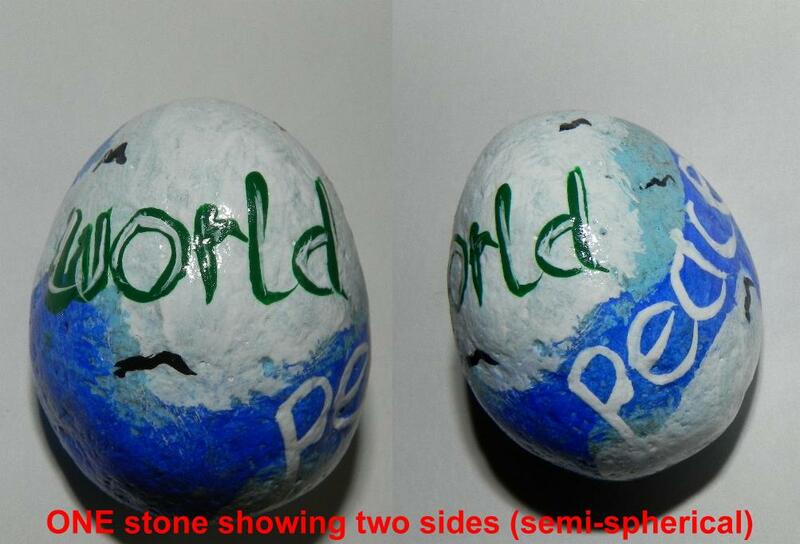 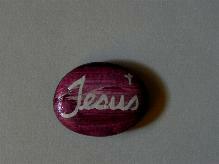 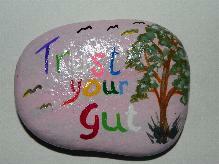 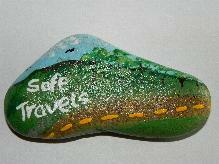 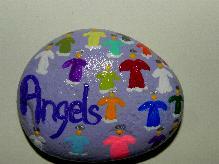 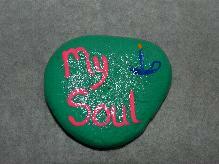 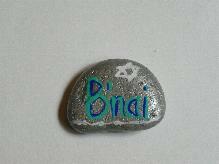 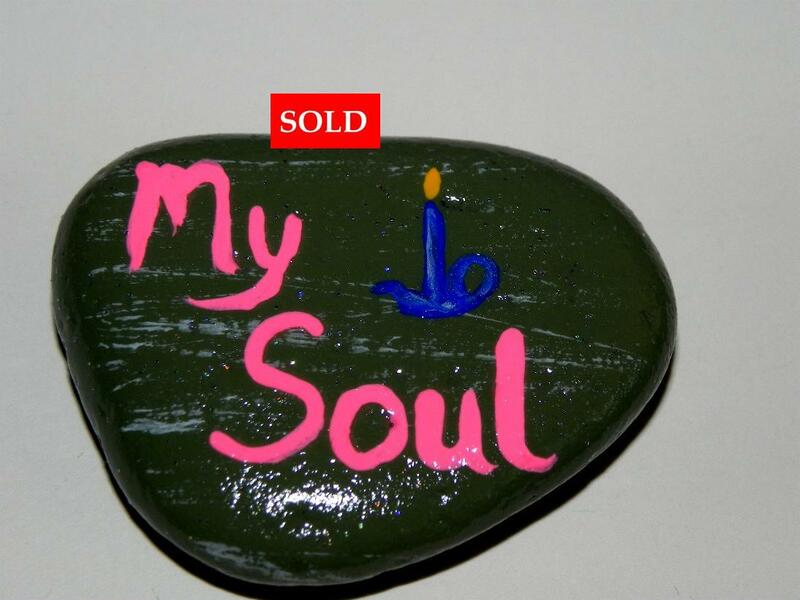 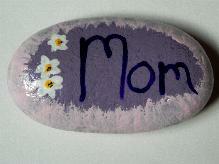 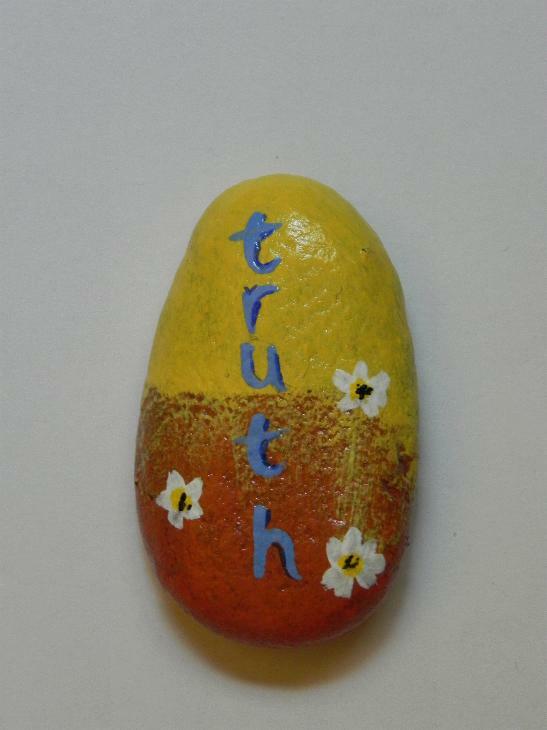 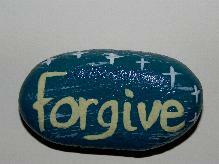 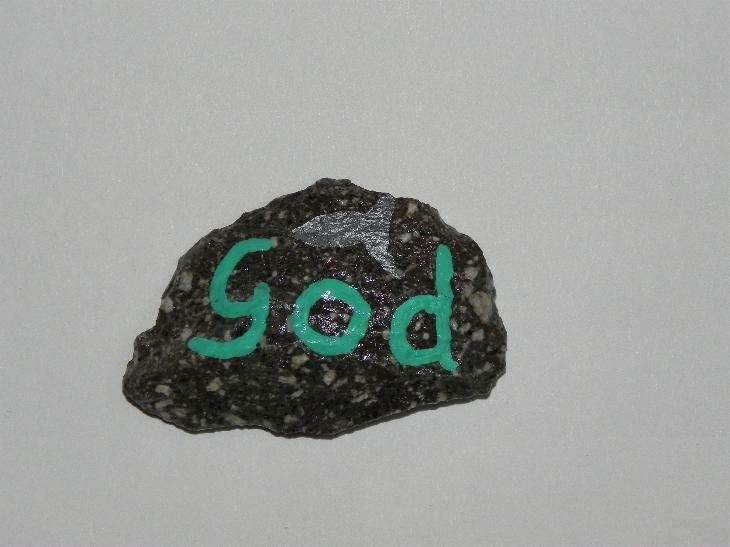 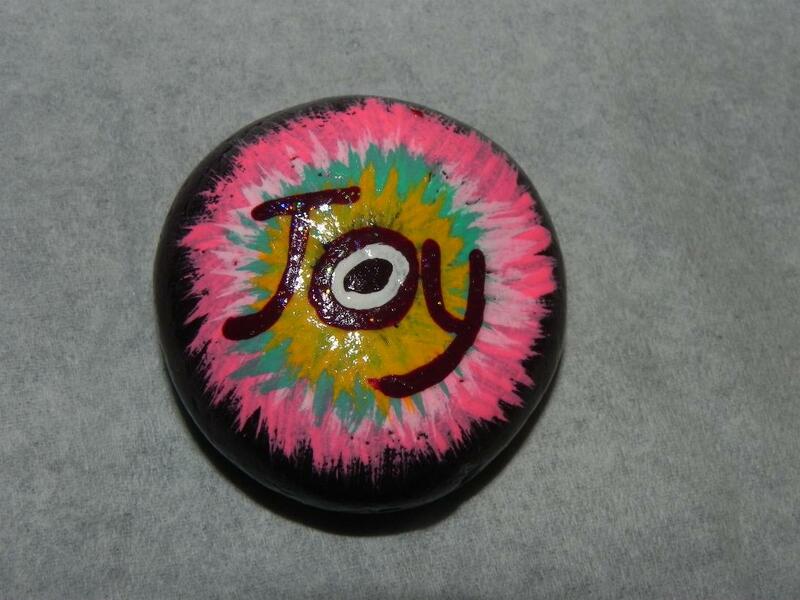 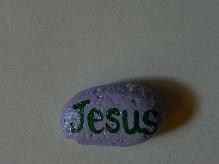 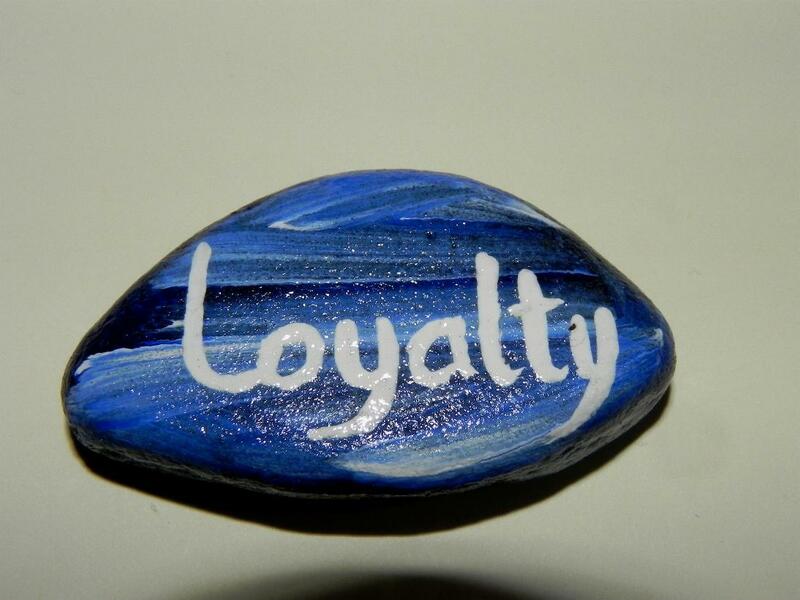 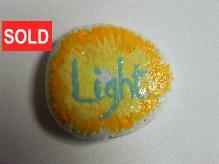 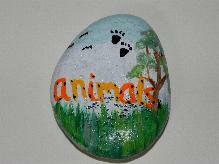 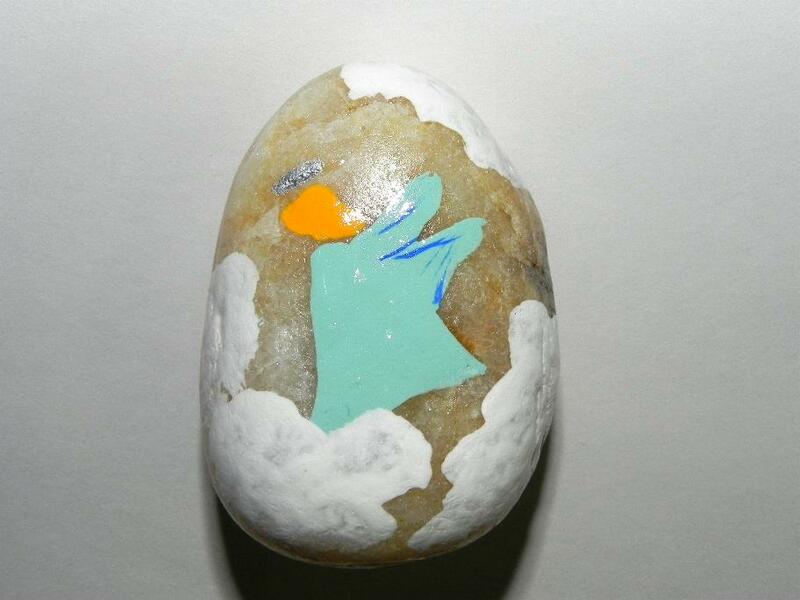 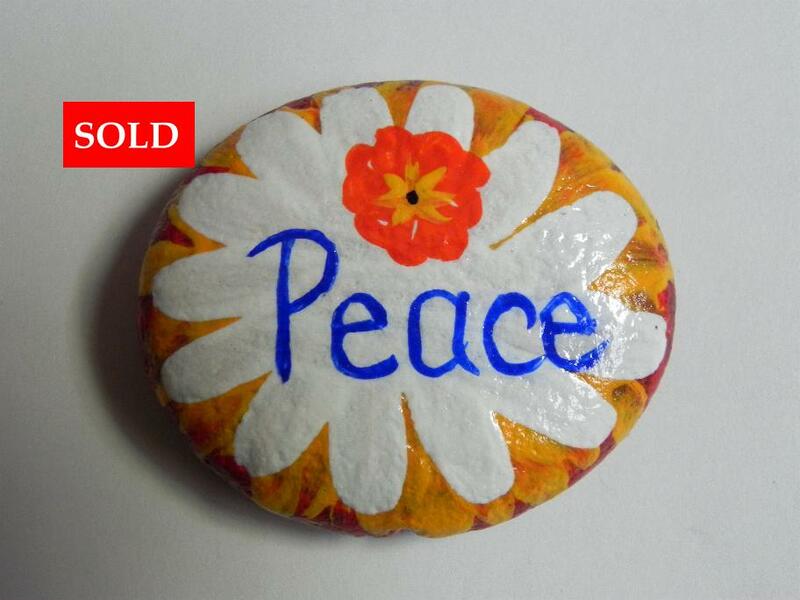 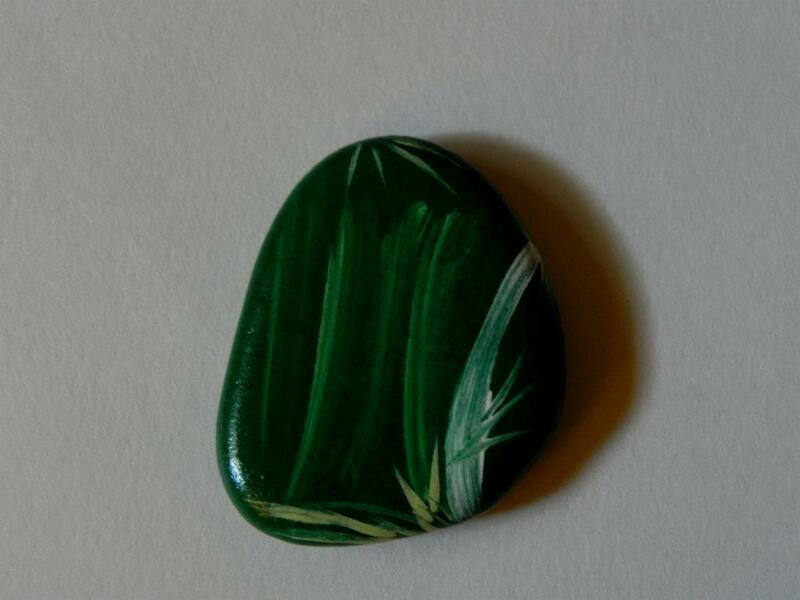 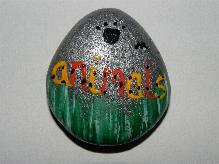 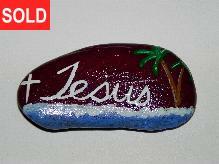 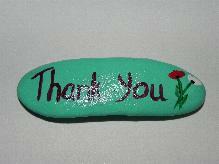 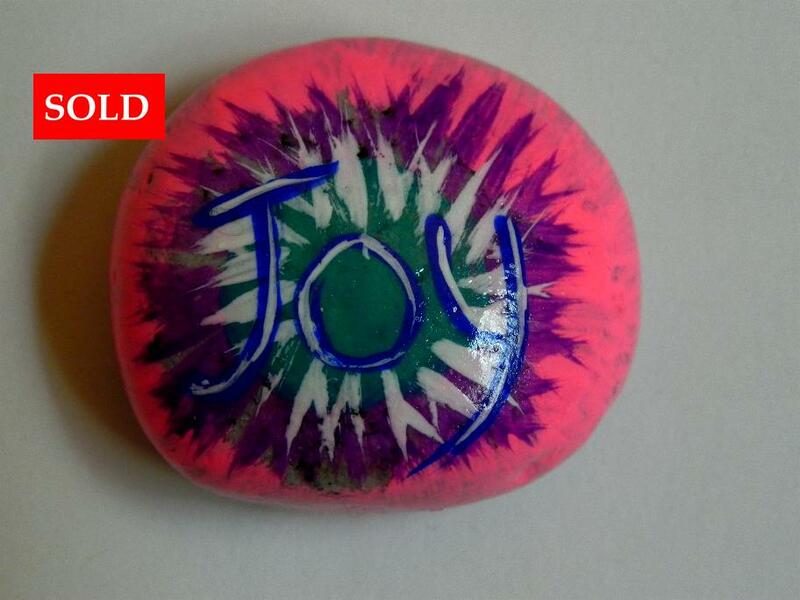 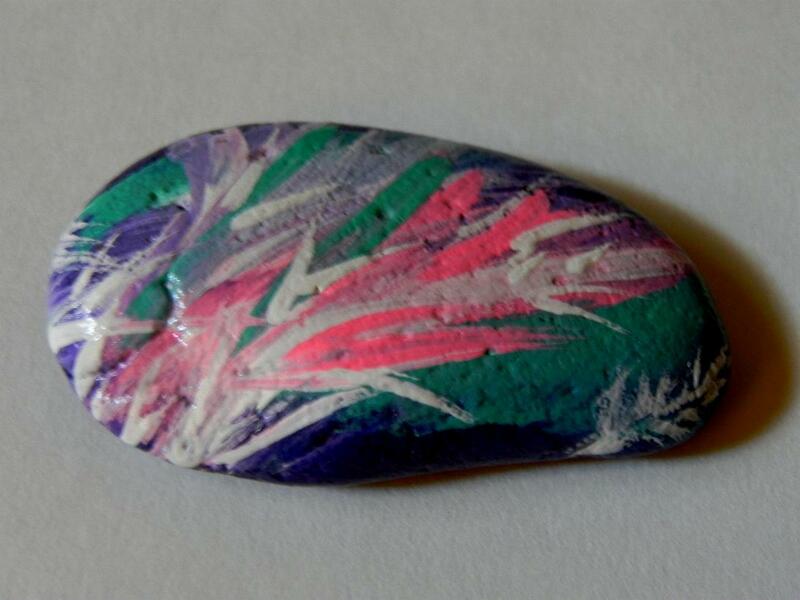 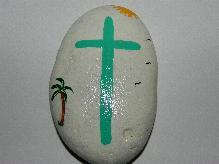 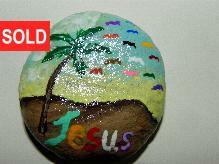 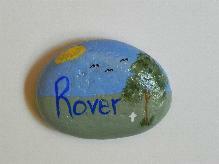 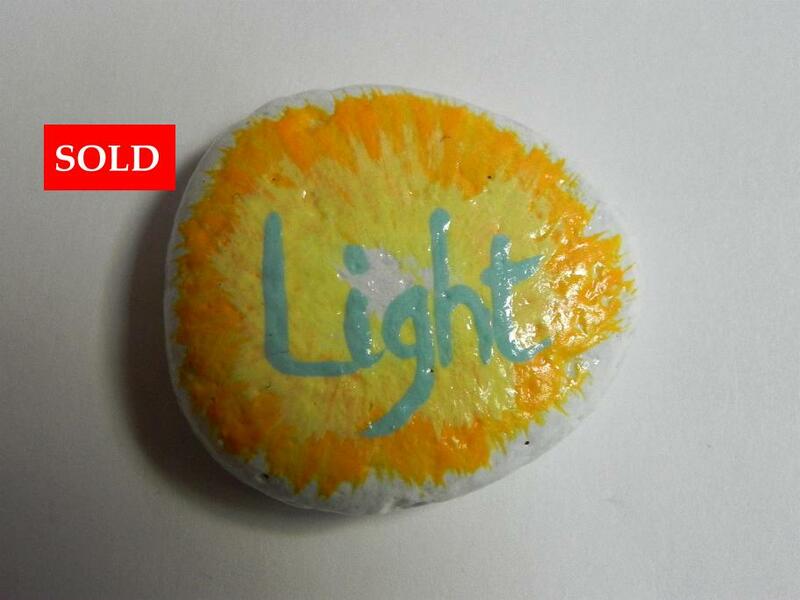 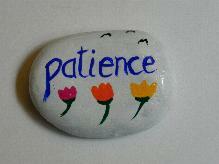 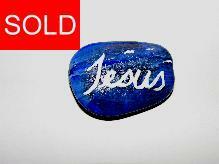 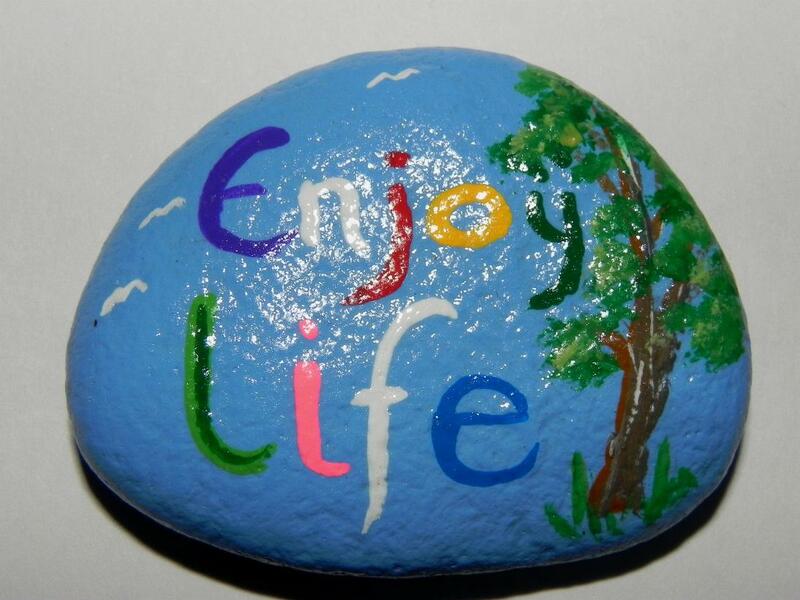 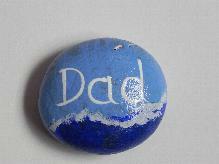 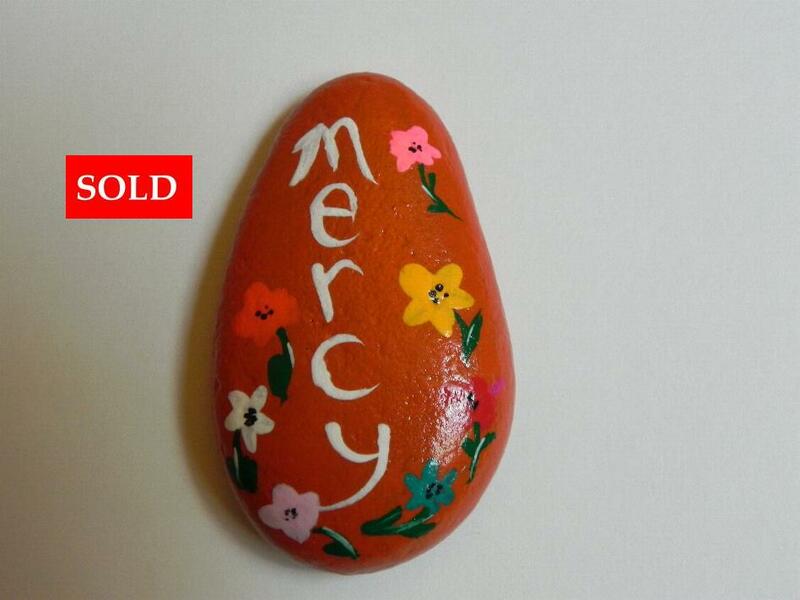 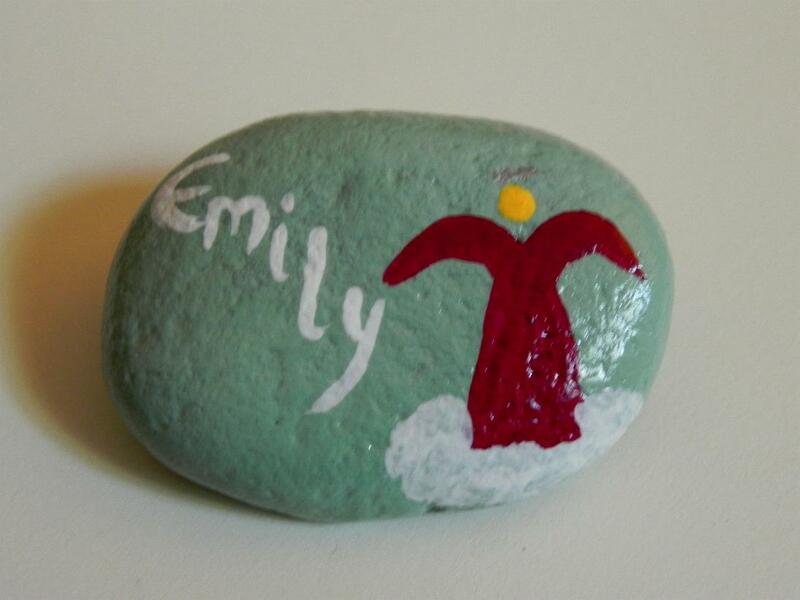 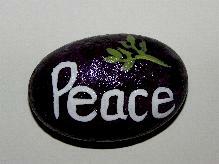 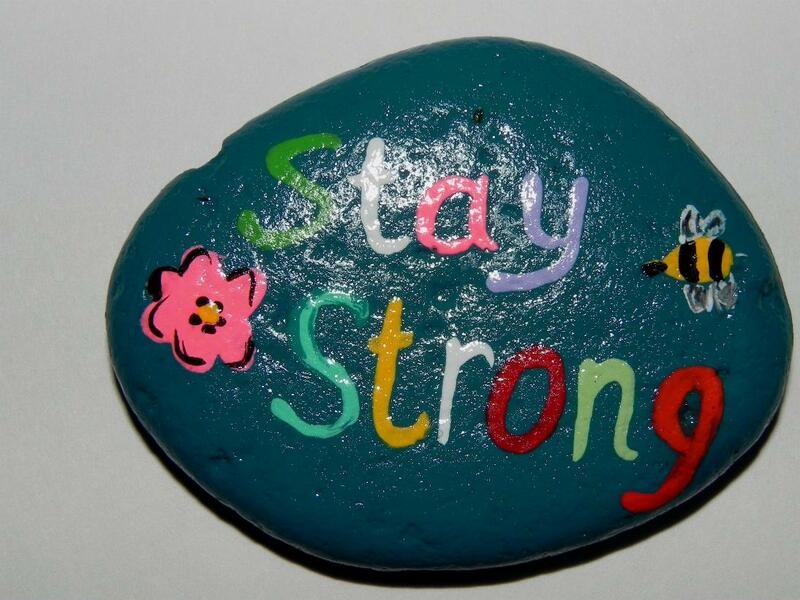 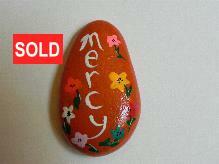 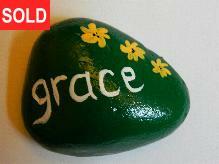 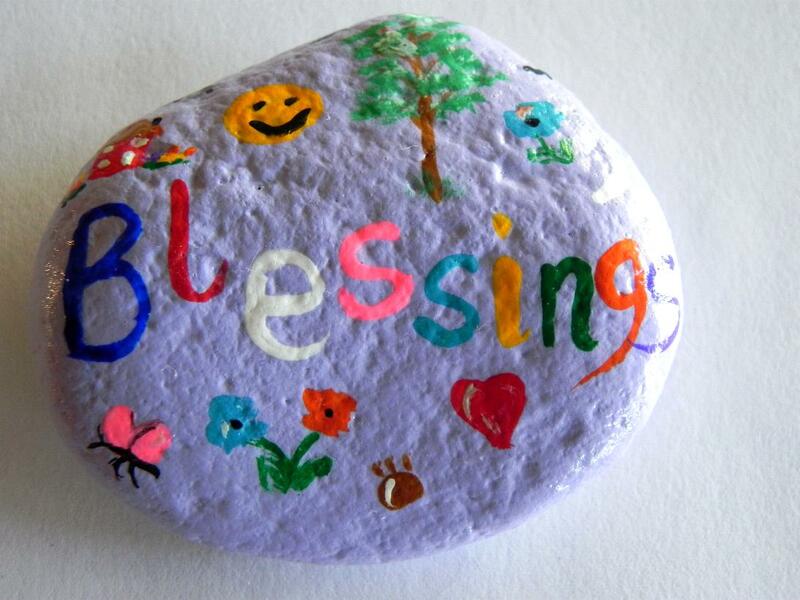 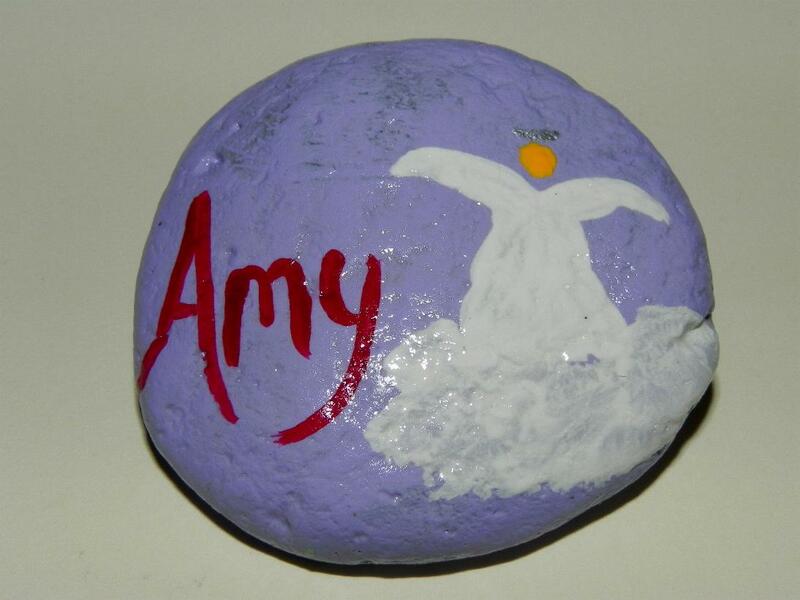 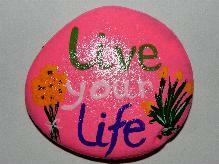 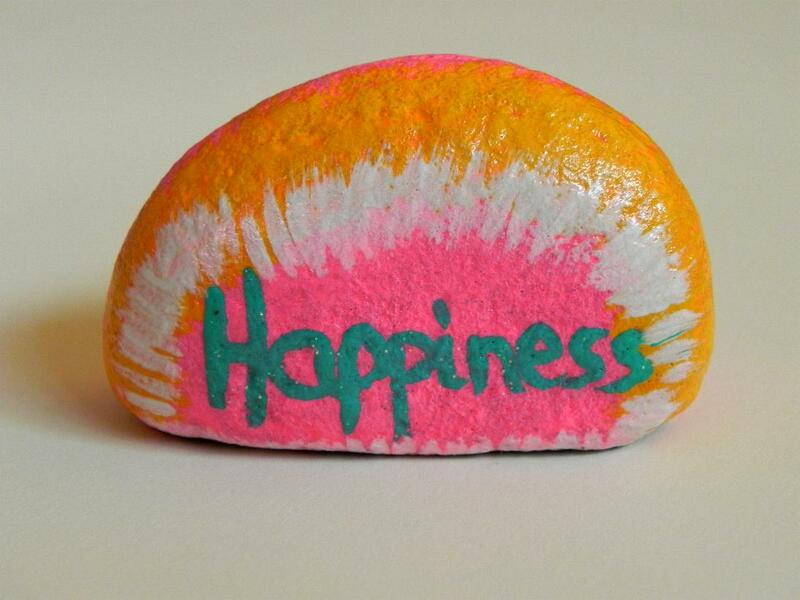 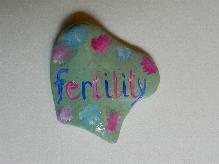 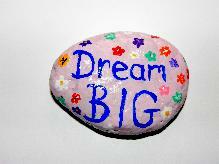 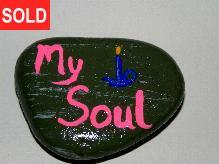 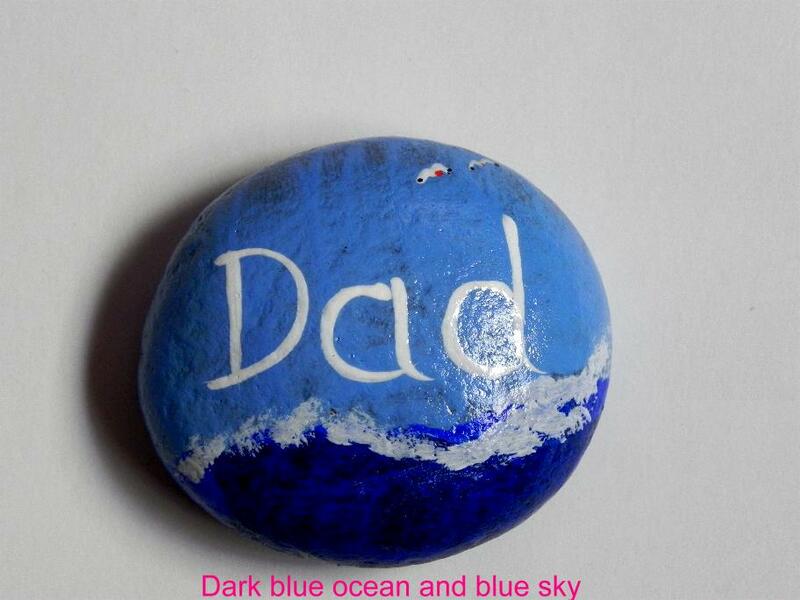 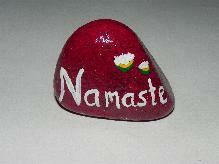 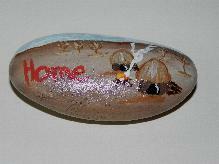 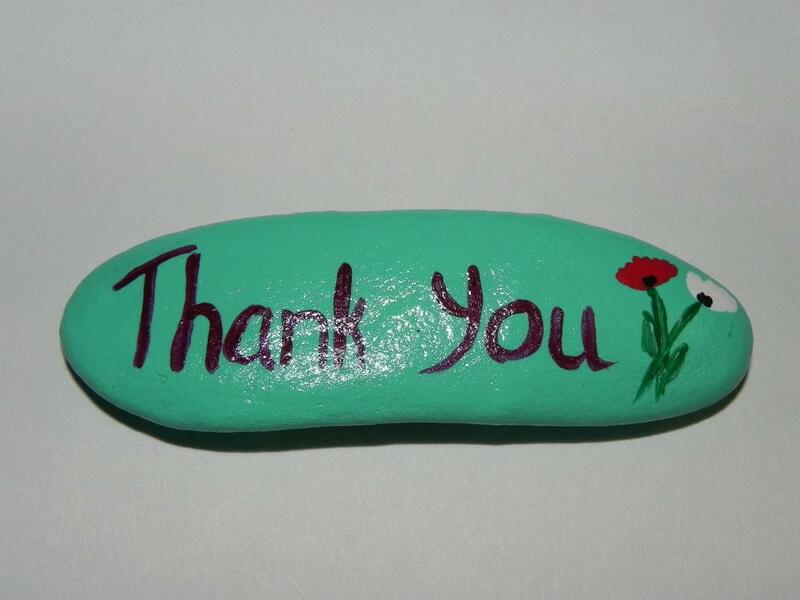 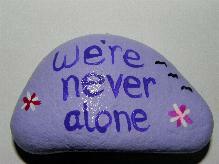 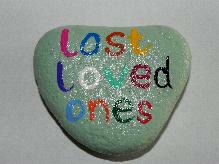 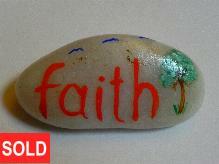 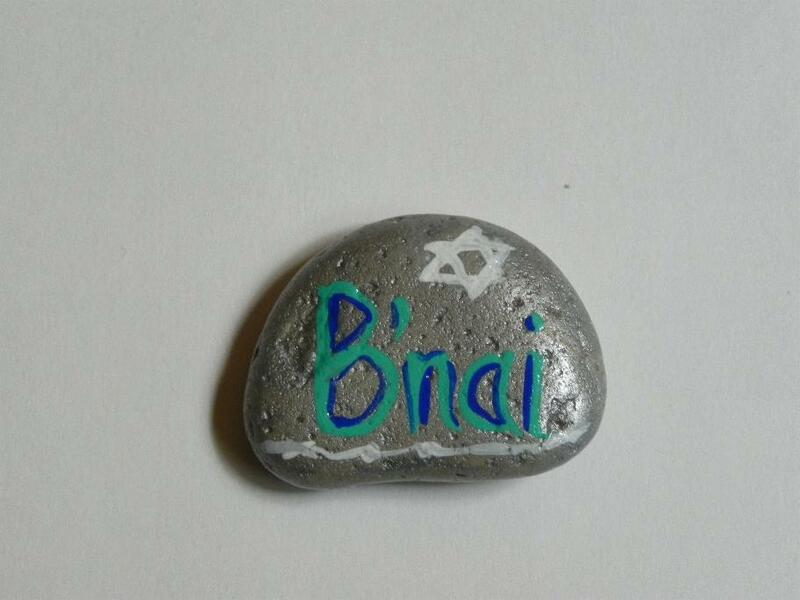 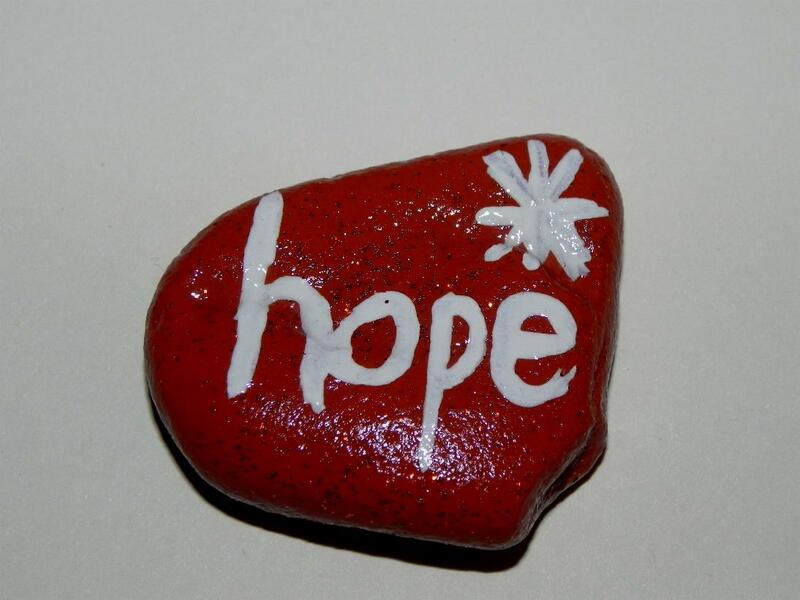 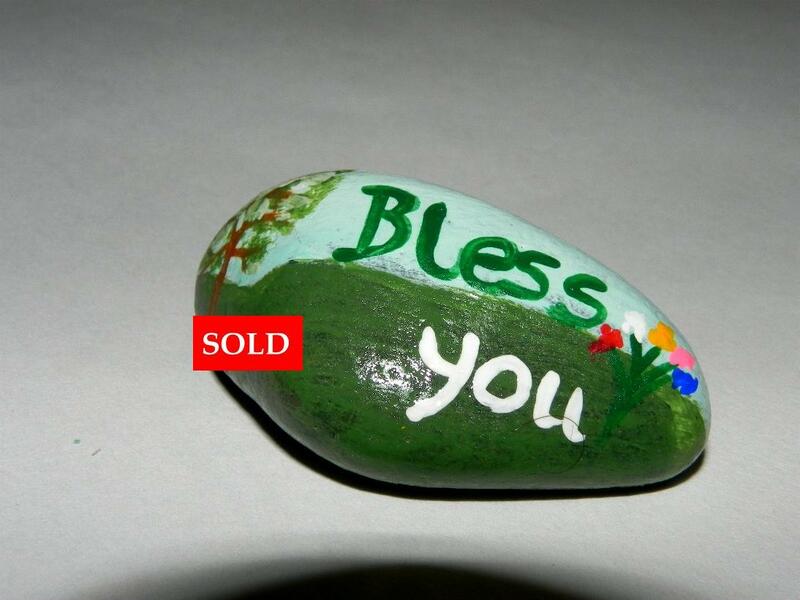 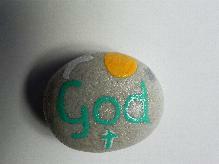 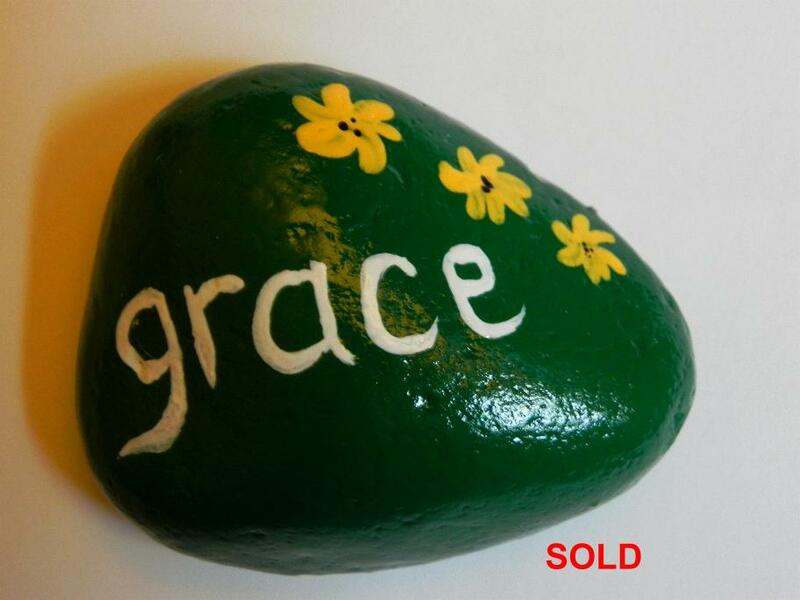 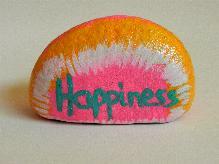 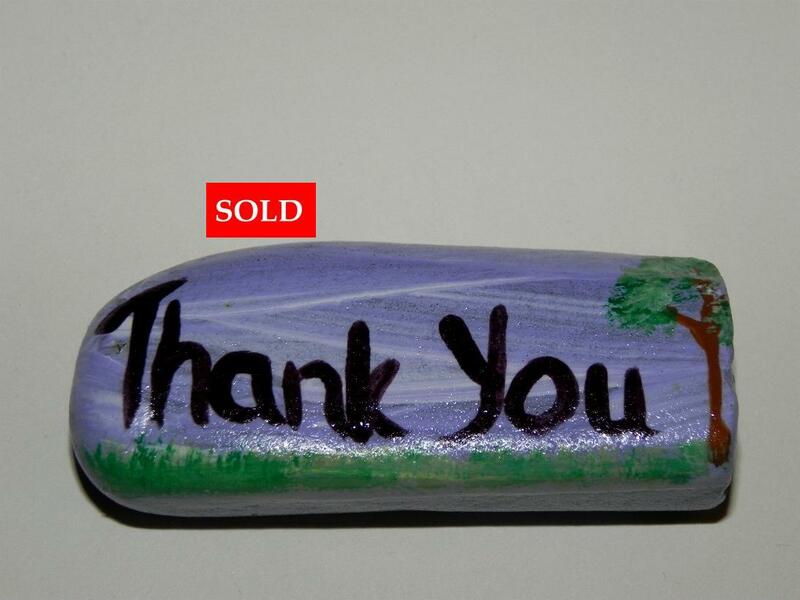 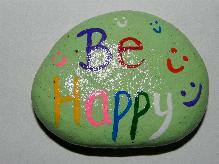 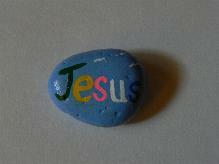 My prayer stones are hand-painted and are original works of art. 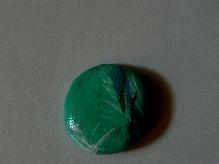 I use acrylic paint and a polycrylic protective finish. 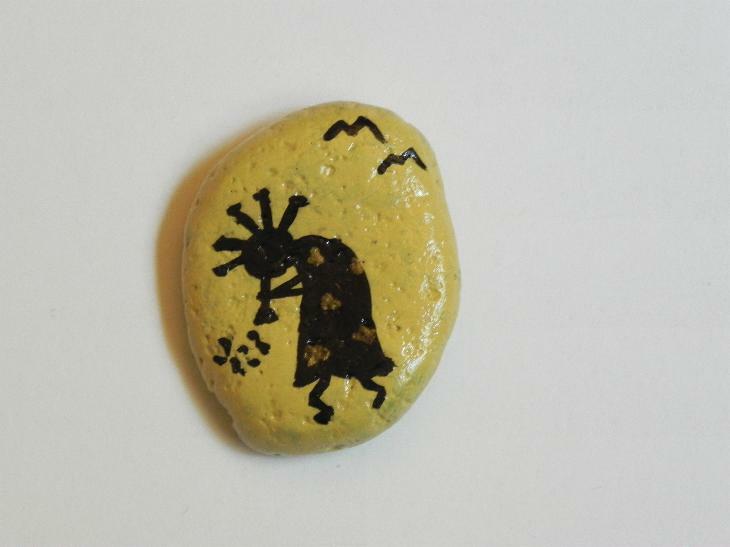 If you are inclined to rub the stone, you might eventually wear away the artwork. It’s best to hold the stone in your hands with the unpainted part touching your skin. 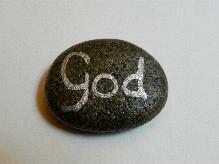 Some of my stones stand on their own so you can look at them while you pray instead of holding them. 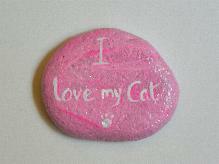 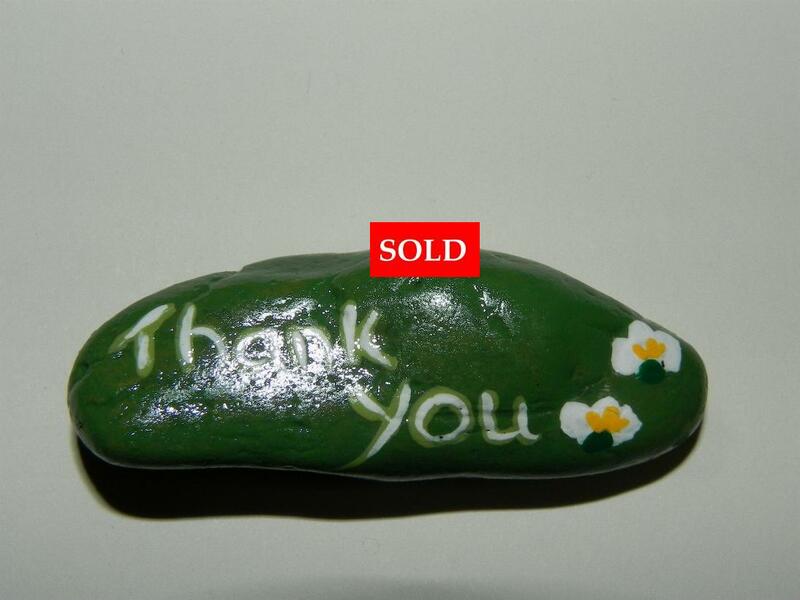 I don’t carve, etch or engrave on any stones, so none are mechanically produced. 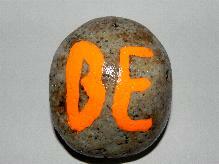 All are individual. Some may have the same words but the colors and designs will be different. Just as some people light candles when they pray, others hold prayer stones. 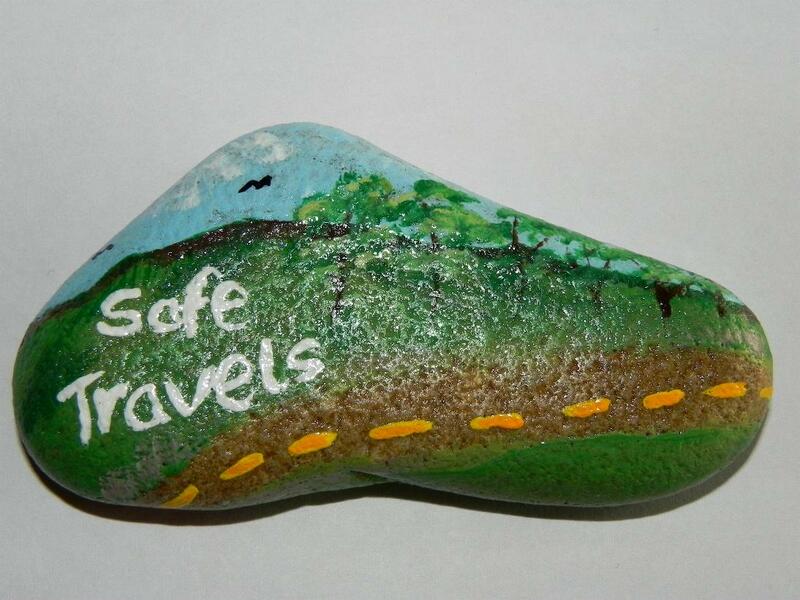 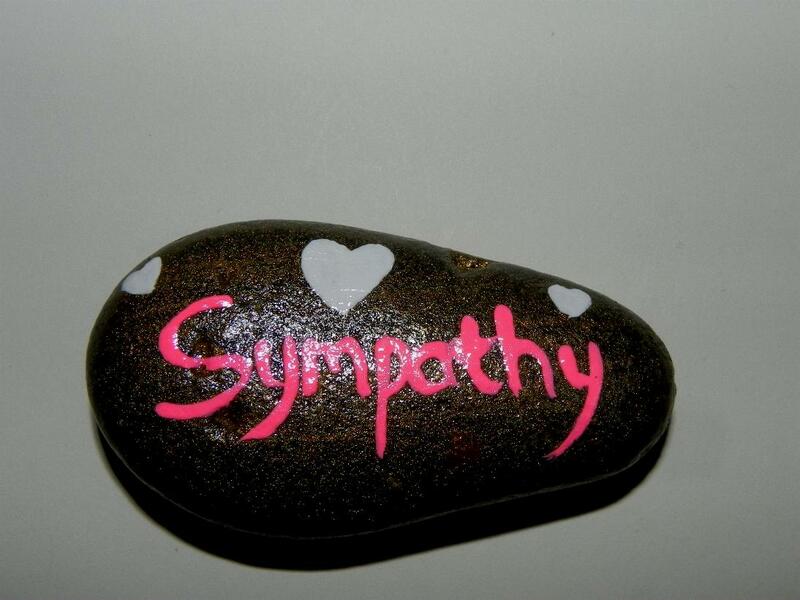 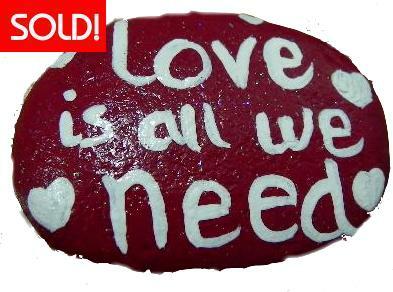 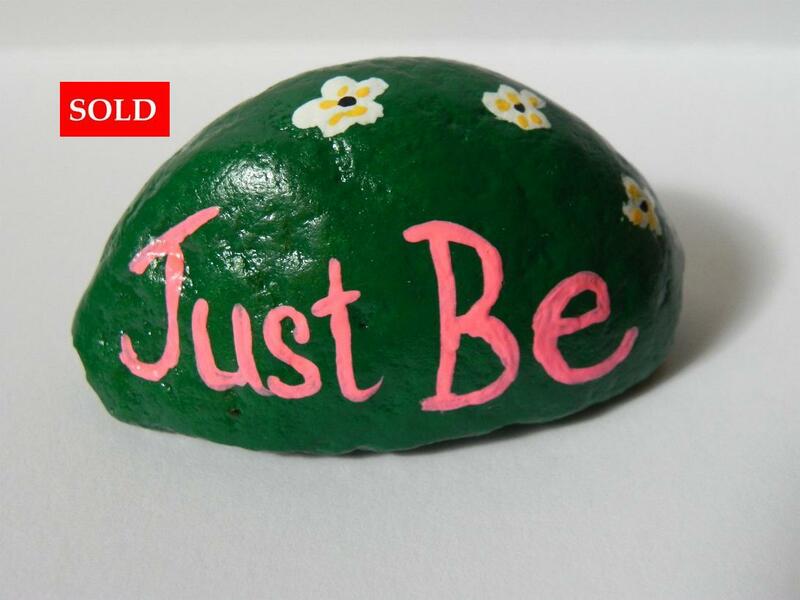 These stones will also make nice little displays somewhere peaceful in your home. 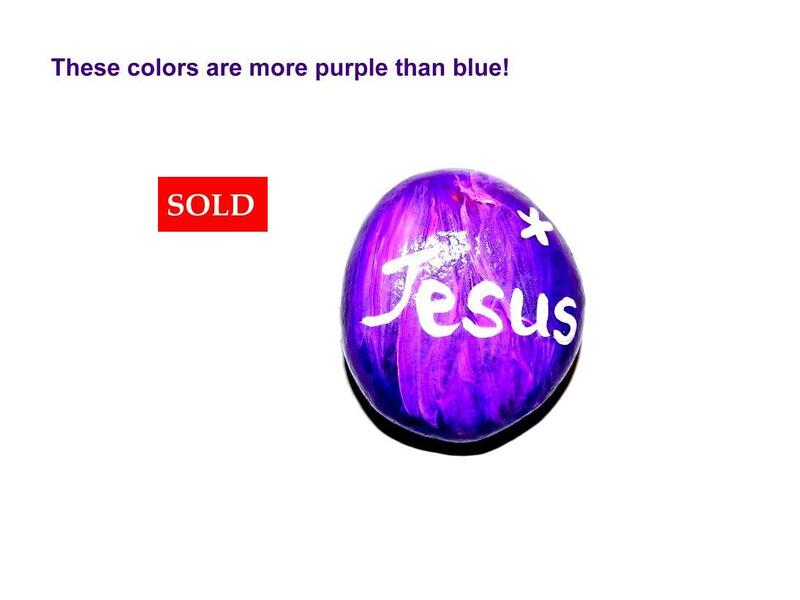 Whatever makes you comfortable. 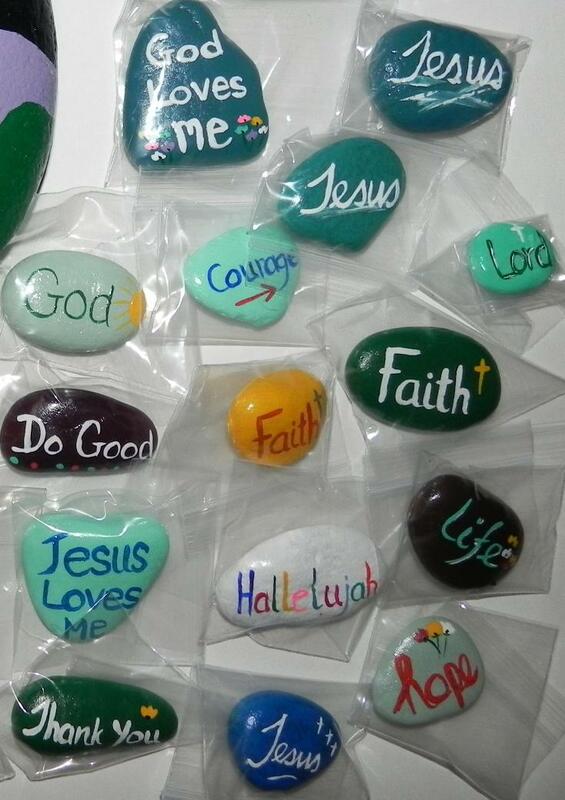 These are prayer stones I made to hand out to homeless people. 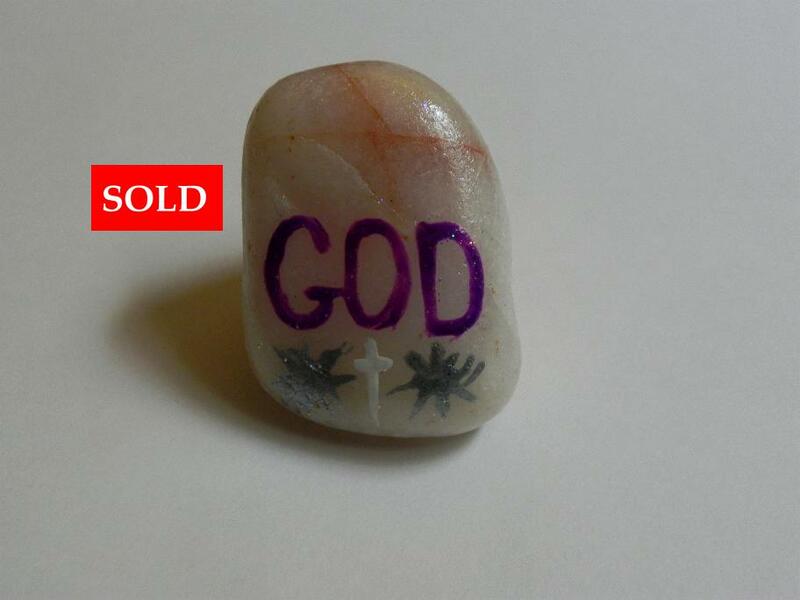 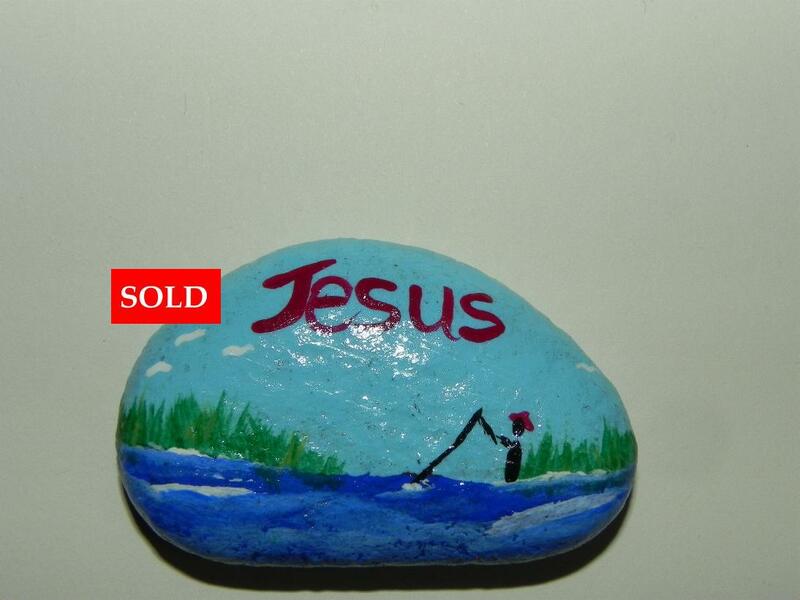 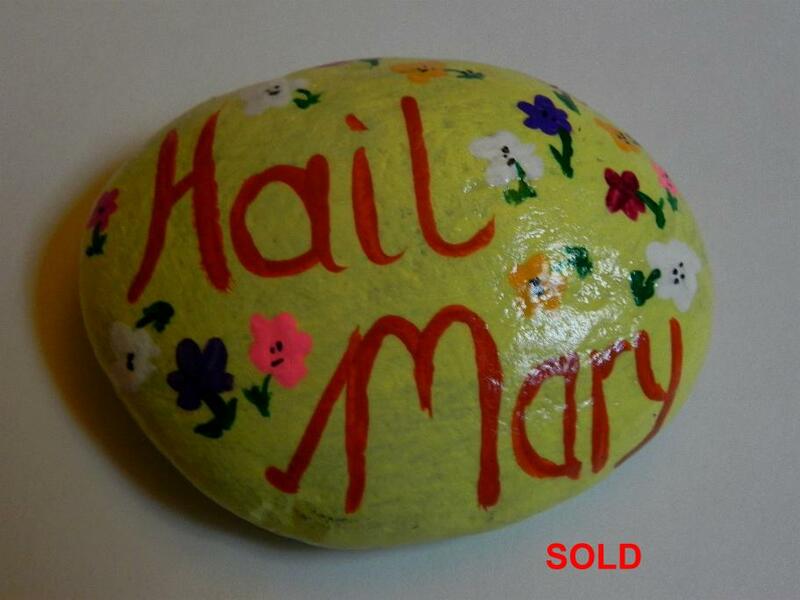 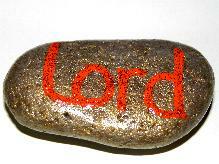 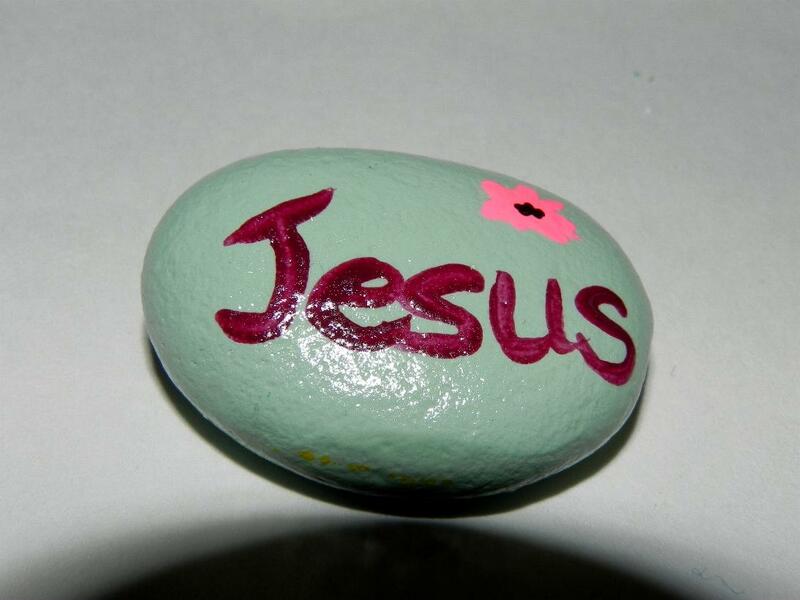 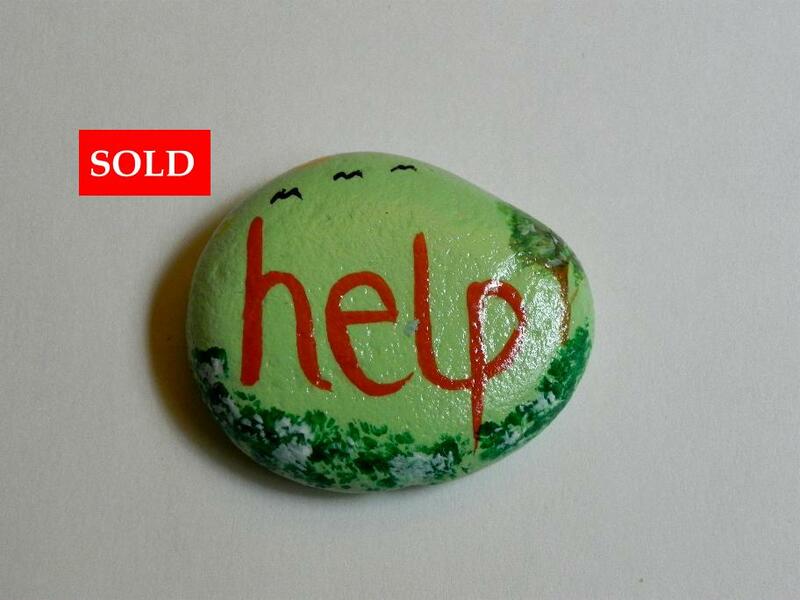 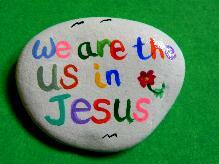 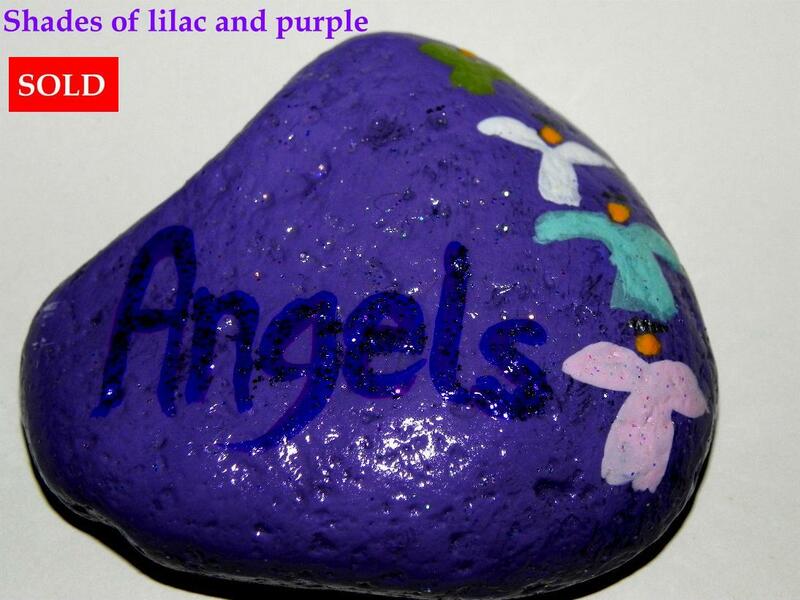 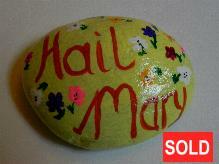 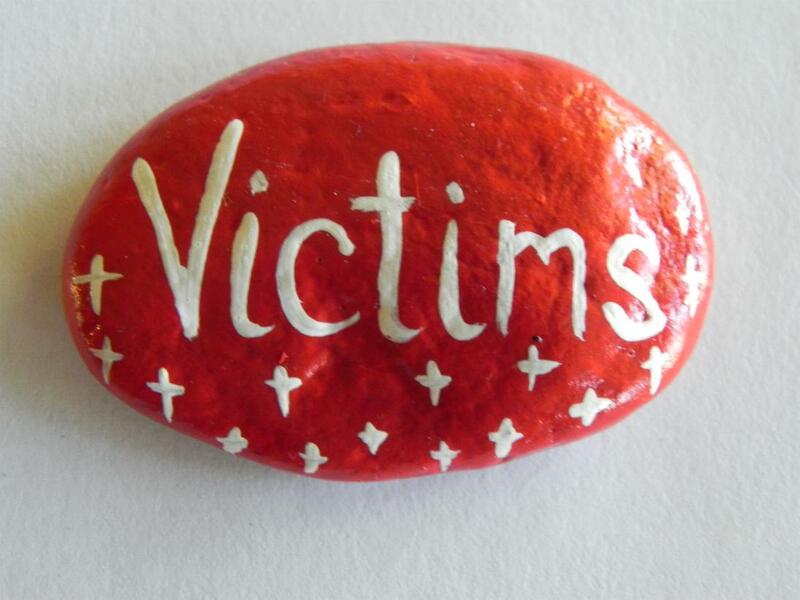 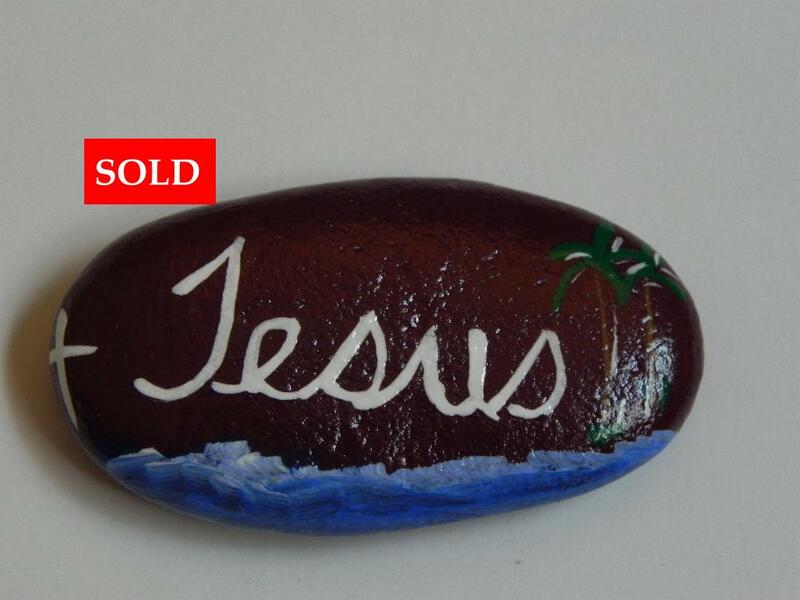 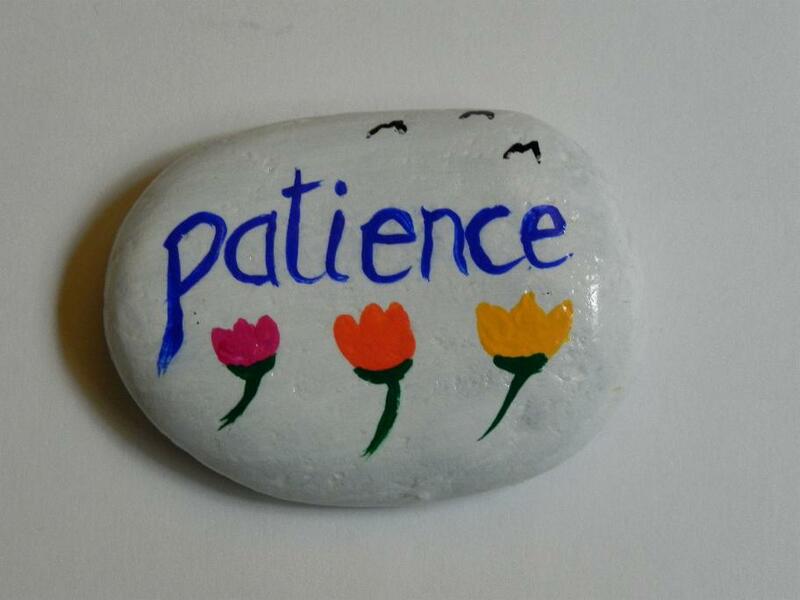 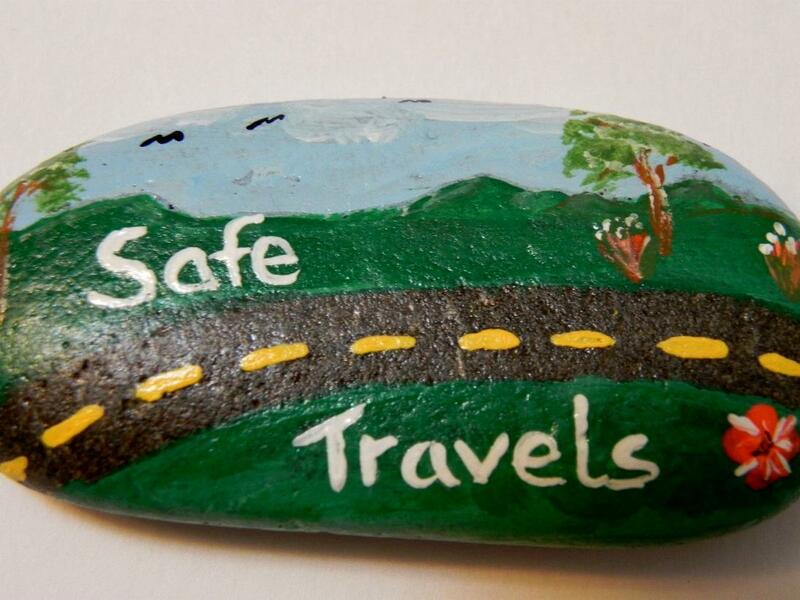 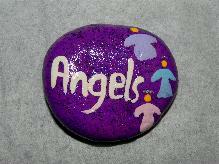 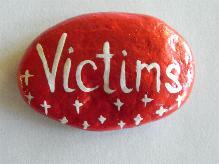 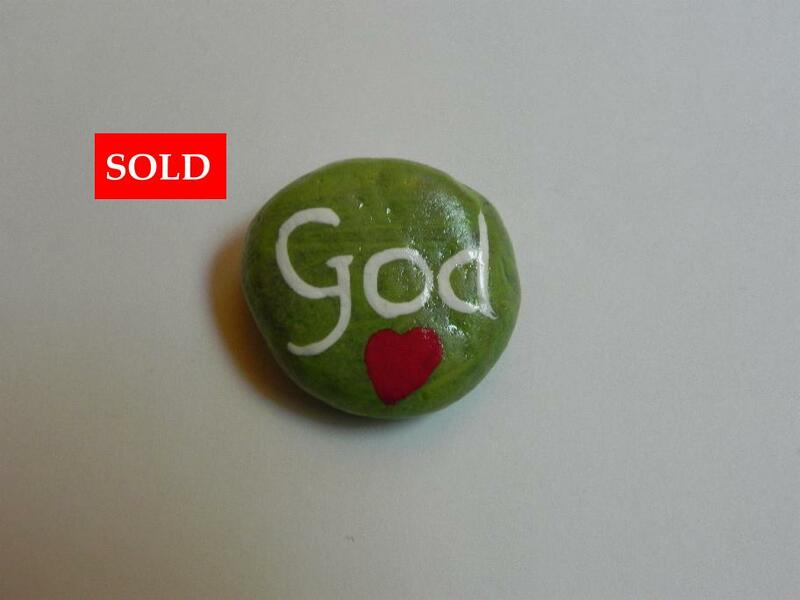 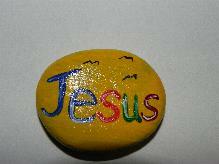 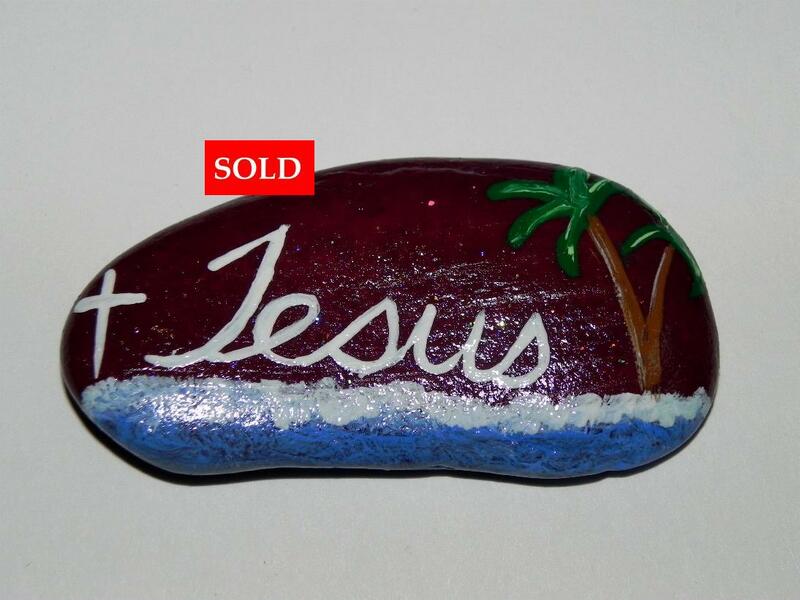 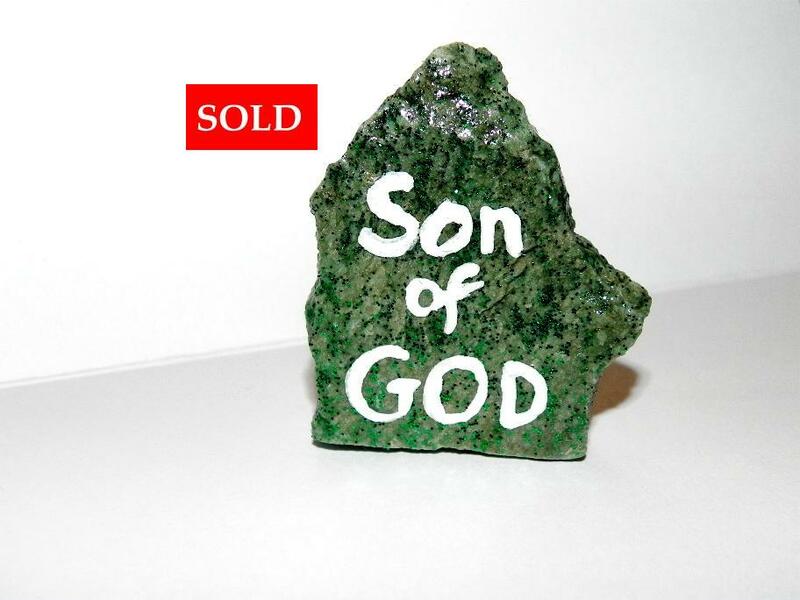 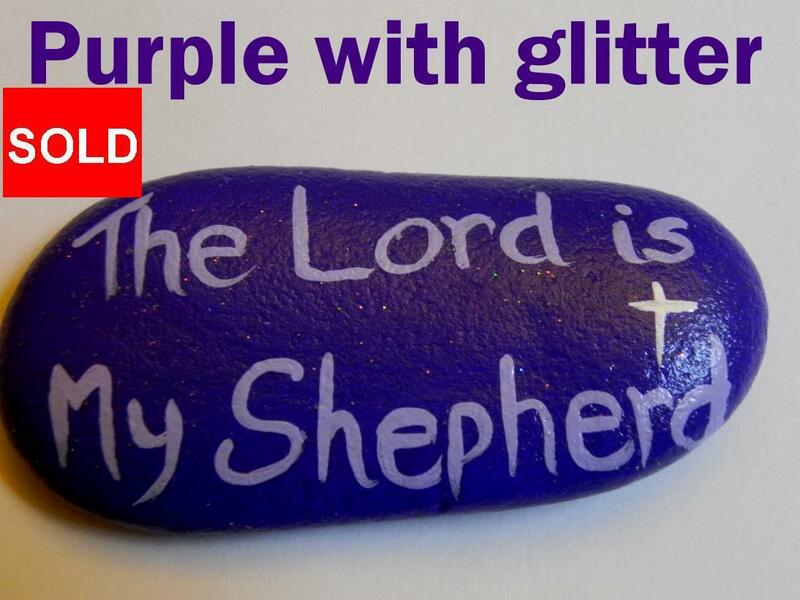 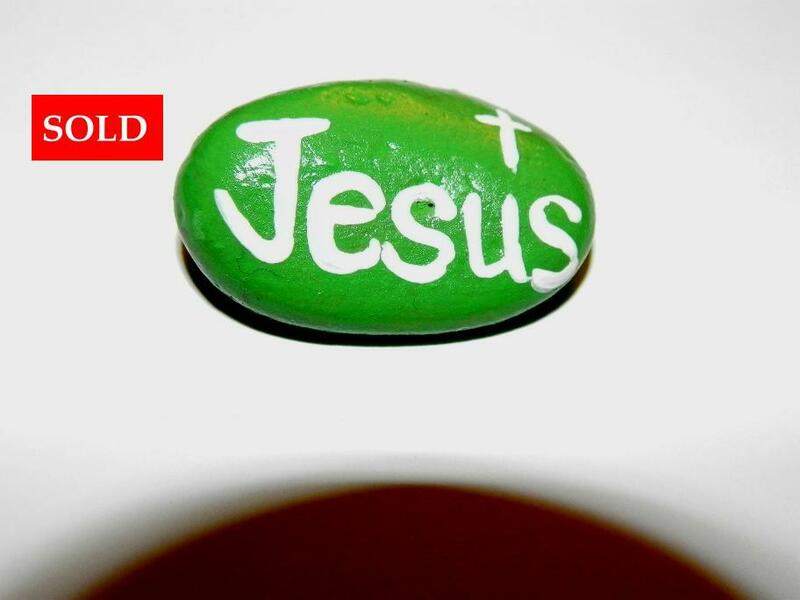 You can order prayer stones which I will make and hand out on your behalf! 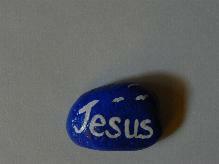 I will take some with me when I go on road trips and hand them out. 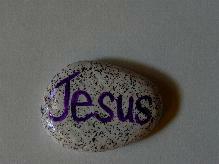 You never know where your stone will end up. 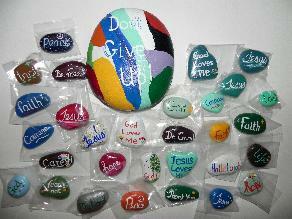 I made this collection for a friend to use as a Prayer Place. 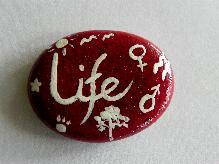 She can arrange and re-arrange her stones as she pleases. All of the stones were found around or near her home and they are much larger than the ones for sale, and so this batch is intensely personal. 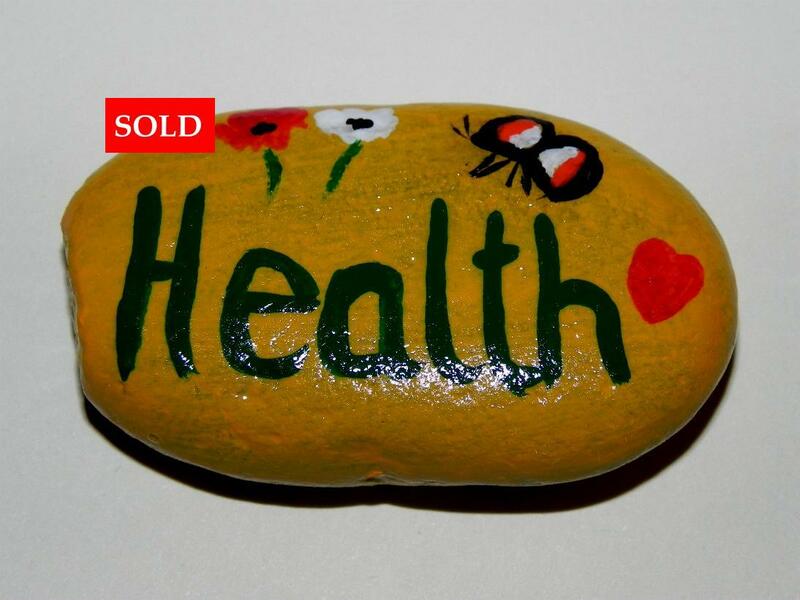 you can pick-up-and-pay and save on s&h. 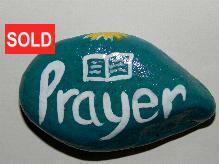 PRICES: All Prayer Stones are individually priced. 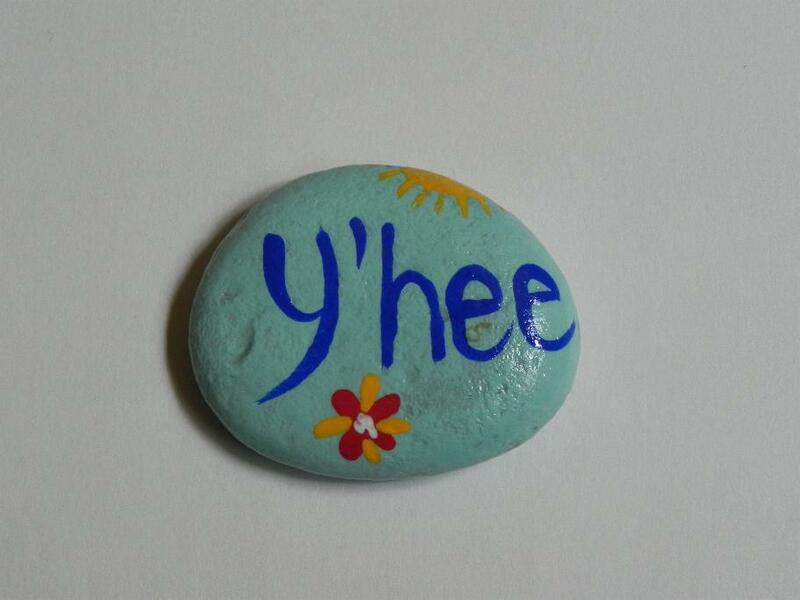 No s&h if you pick up in Fountain, CO! 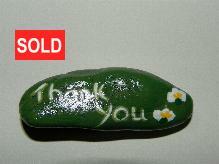 SOLD stones can be re-ordered. 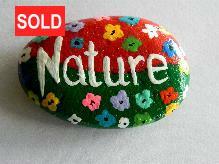 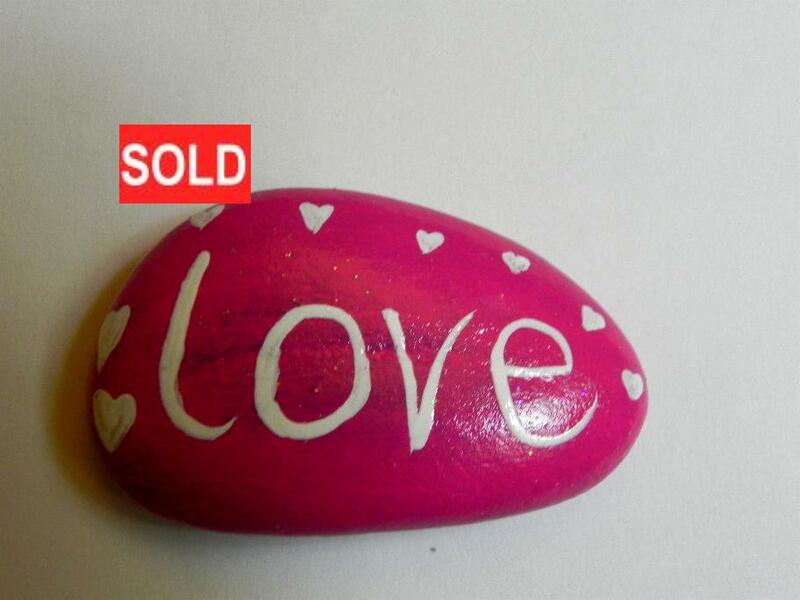 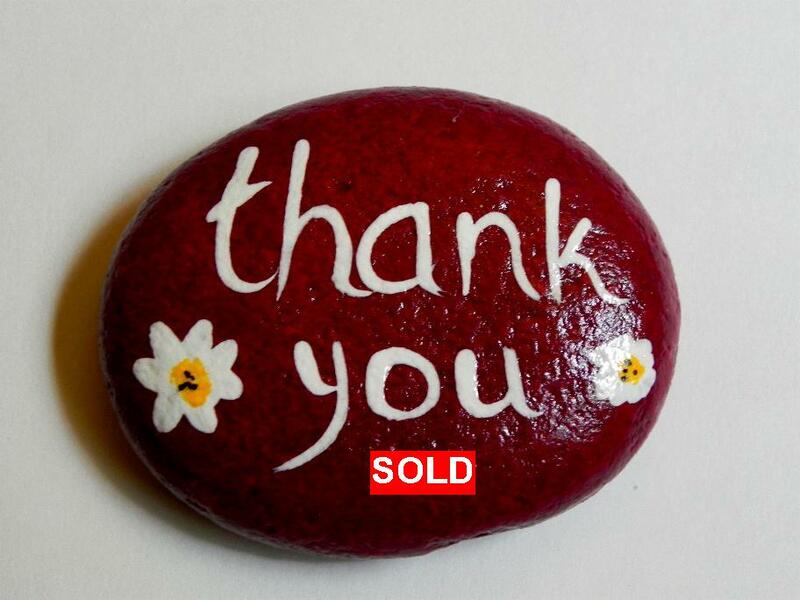 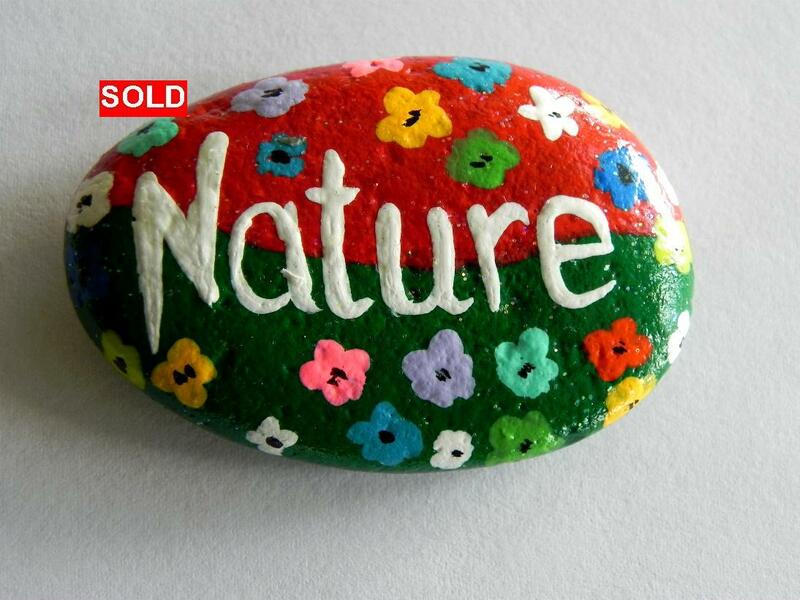 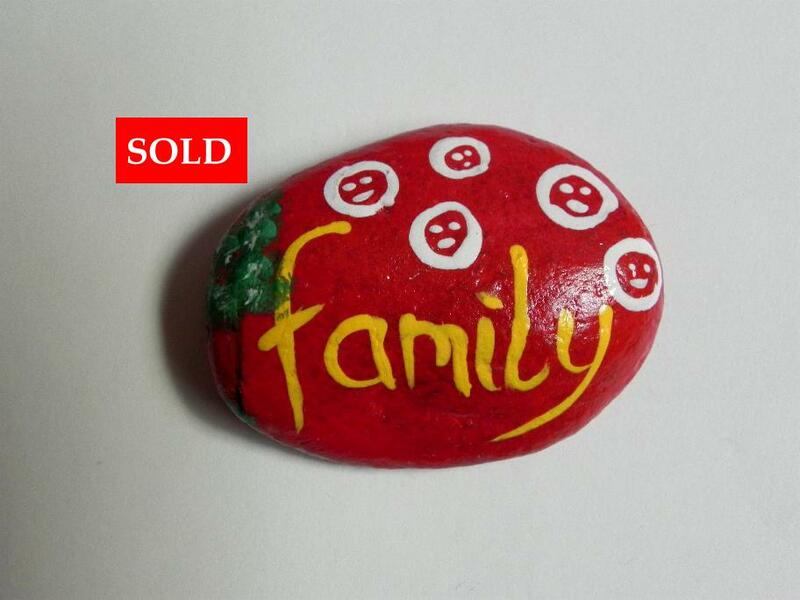 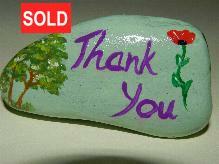 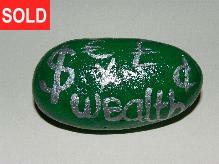 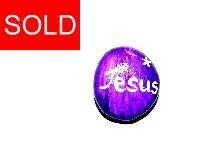 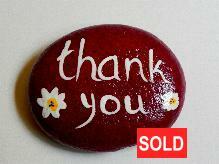 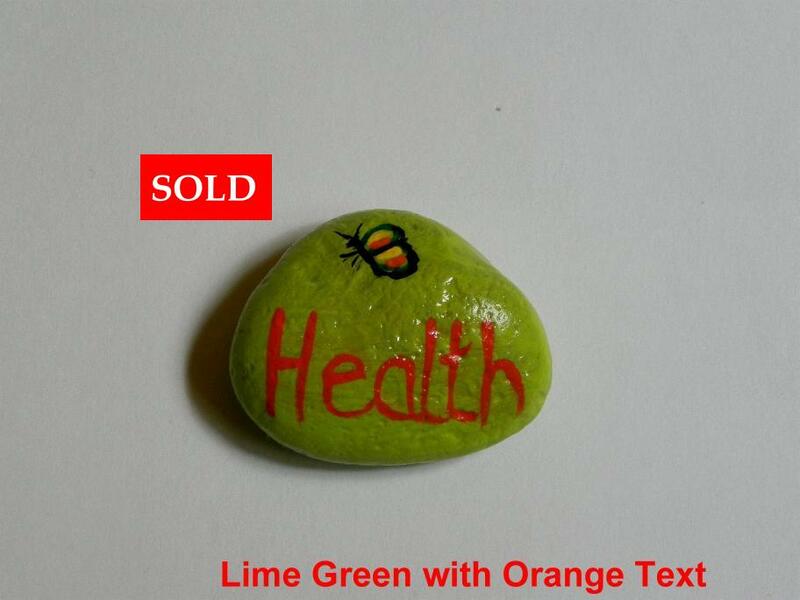 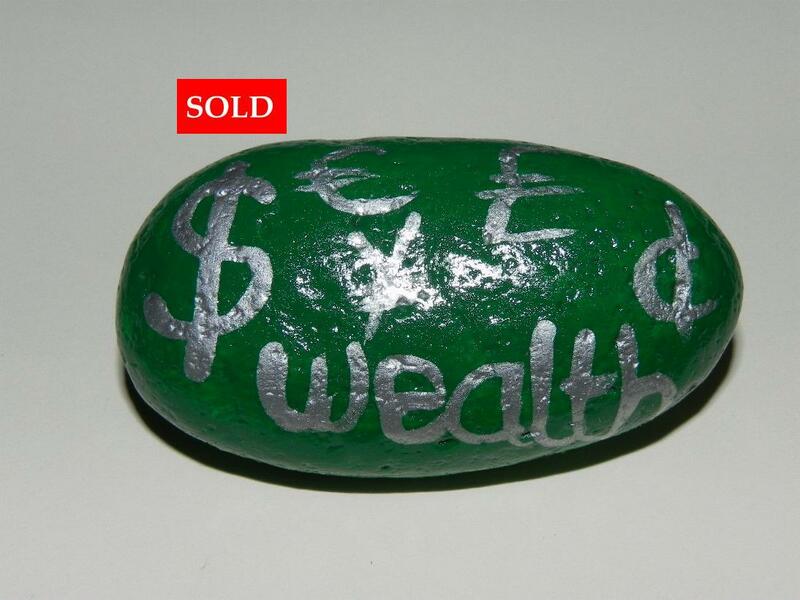 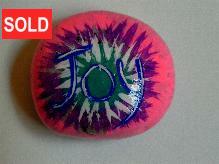 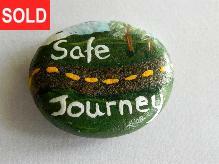 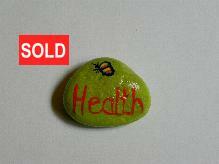 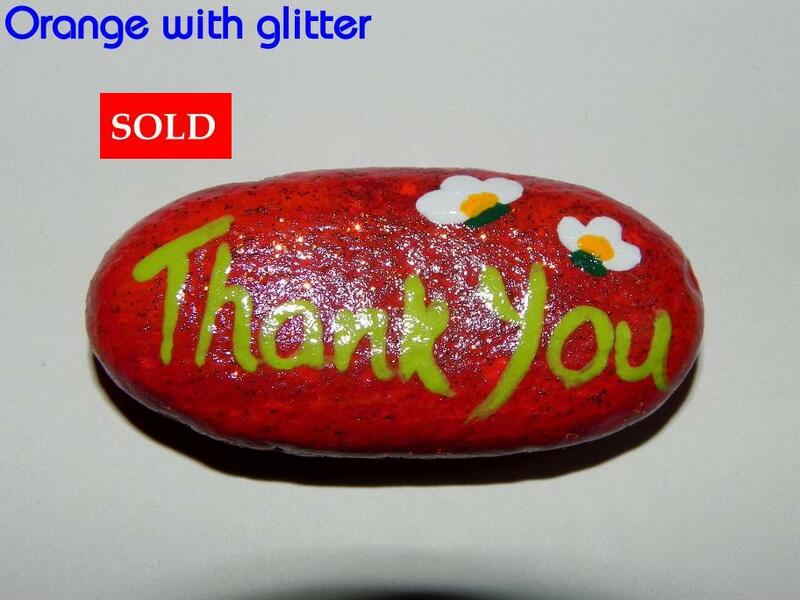 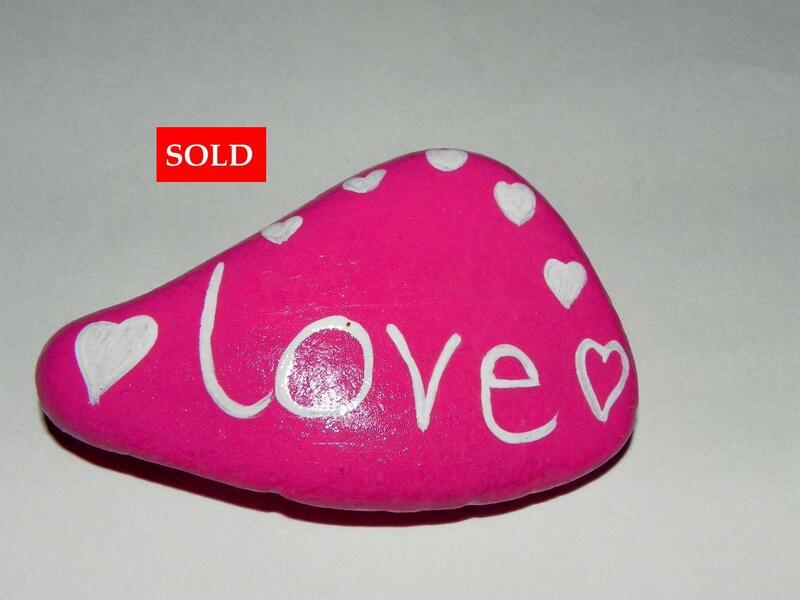 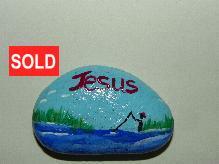 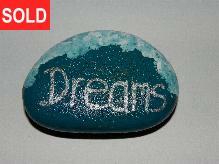 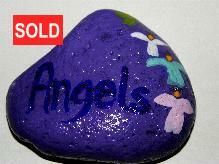 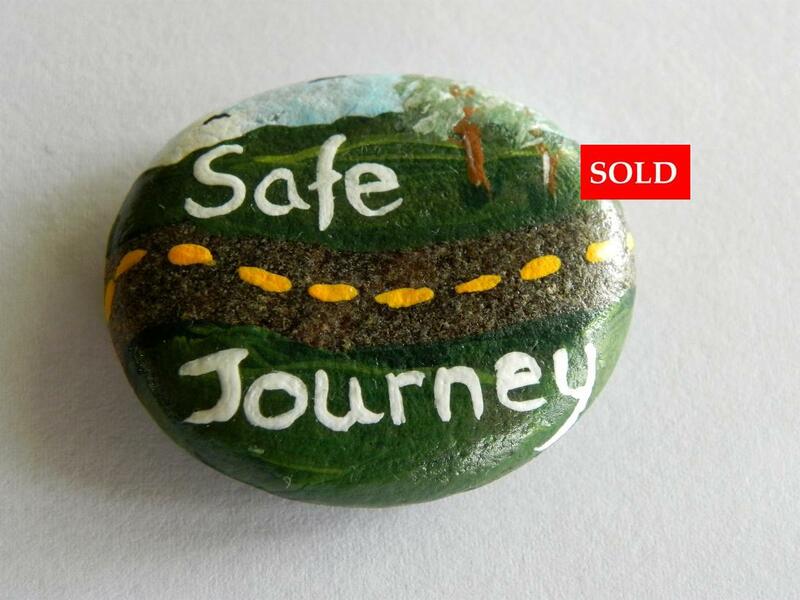 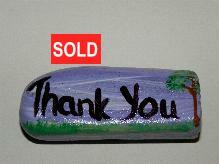 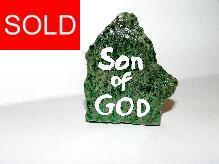 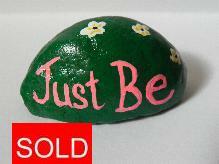 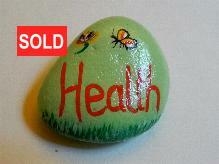 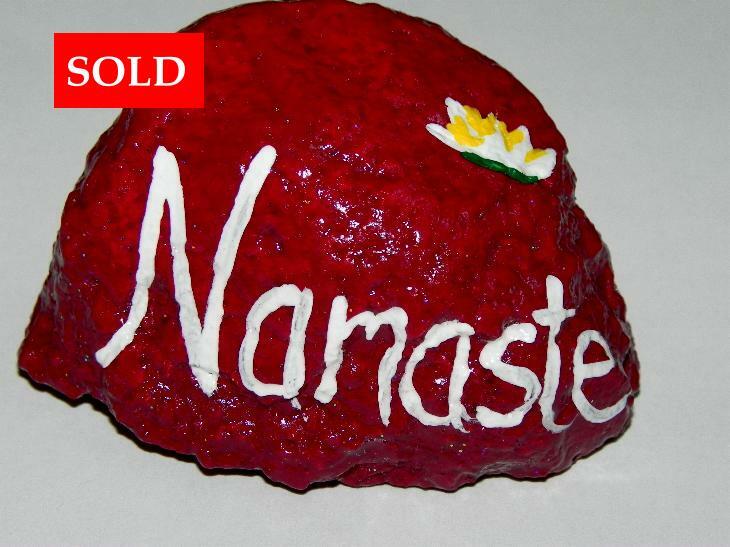 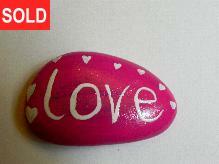 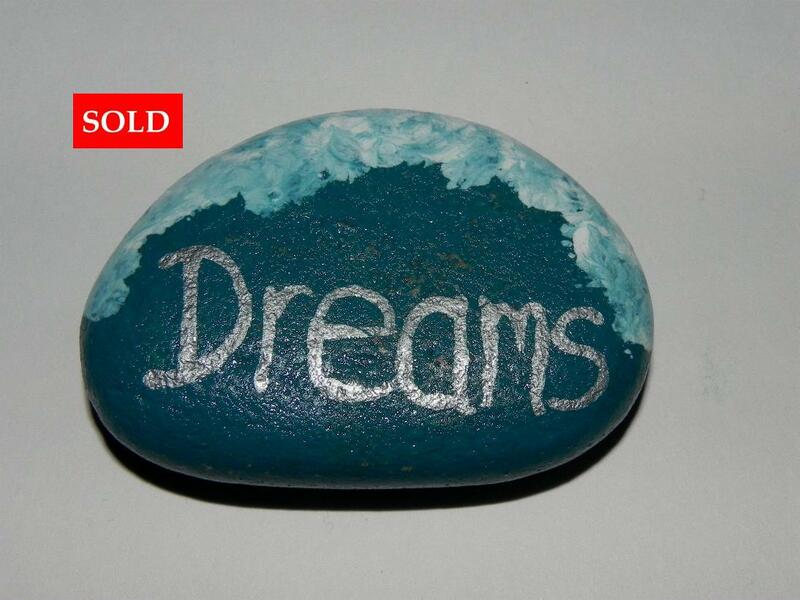 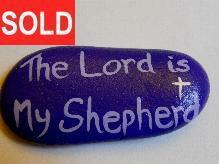 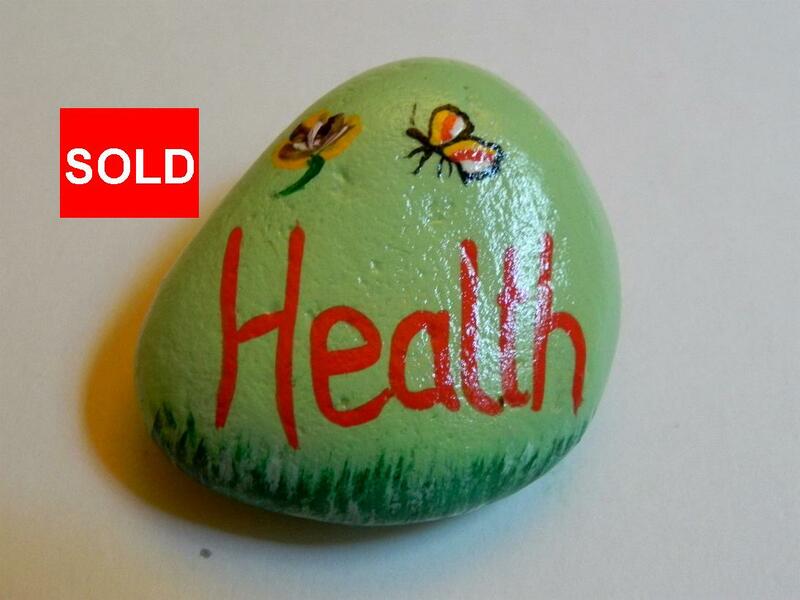 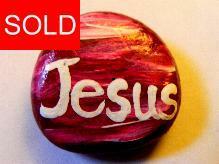 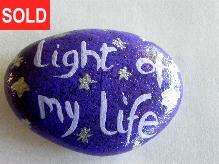 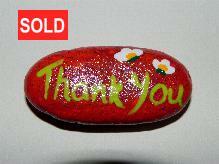 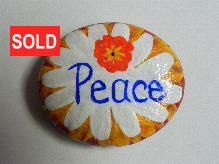 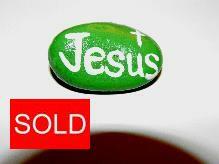 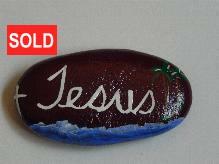 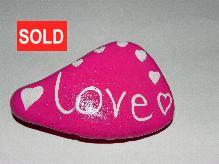 Sold Stones which you can re-order by emailing me. 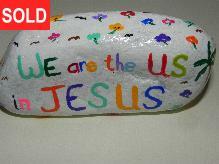 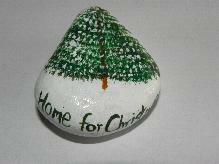 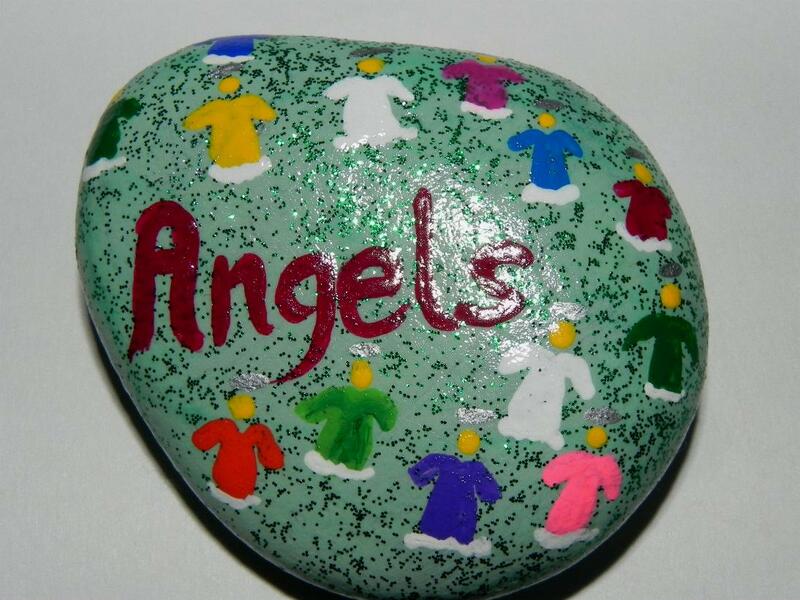 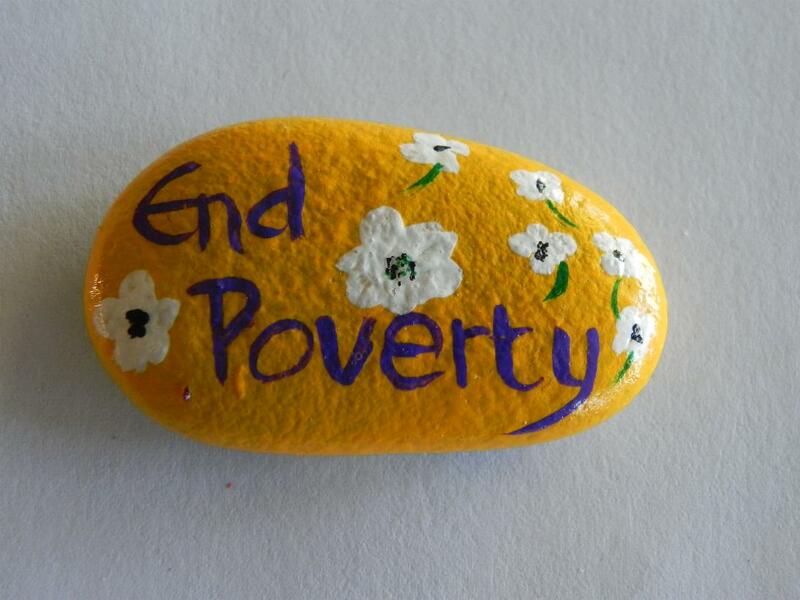 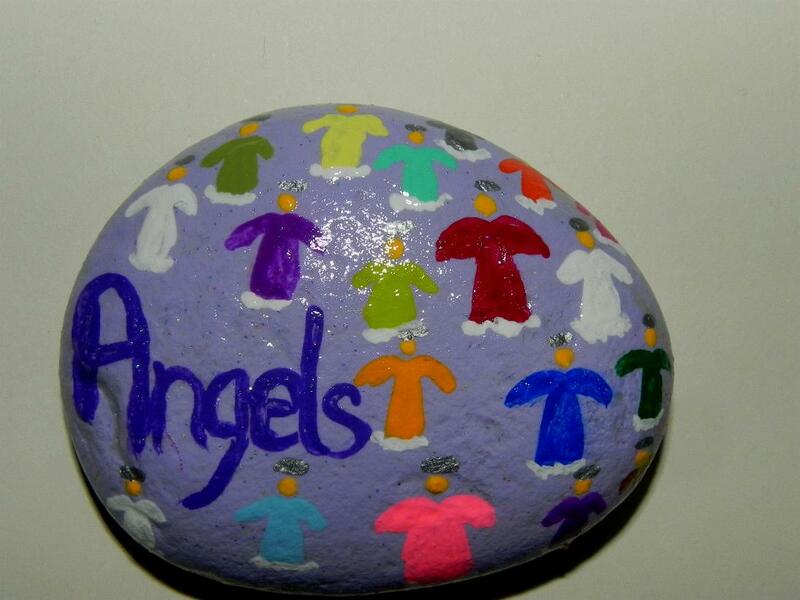 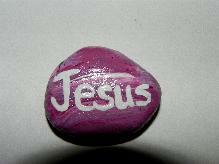 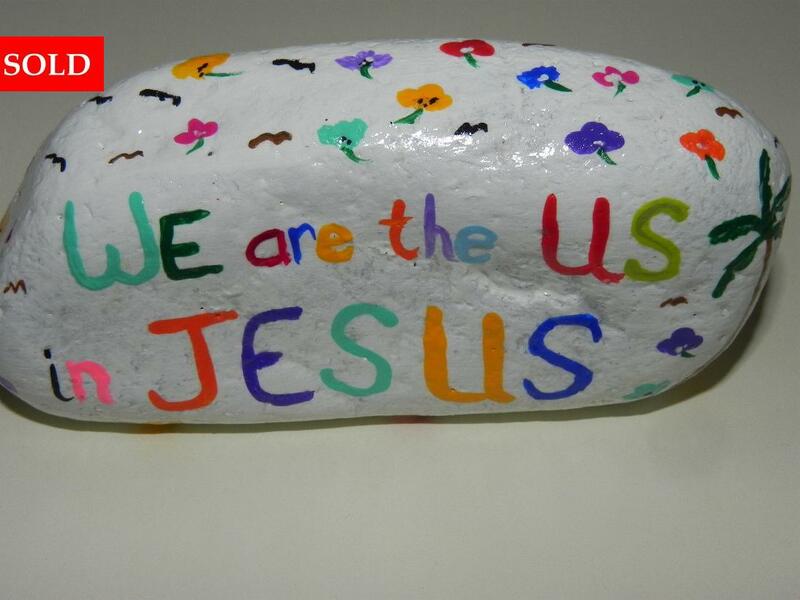 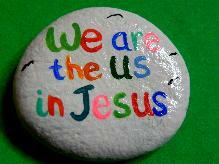 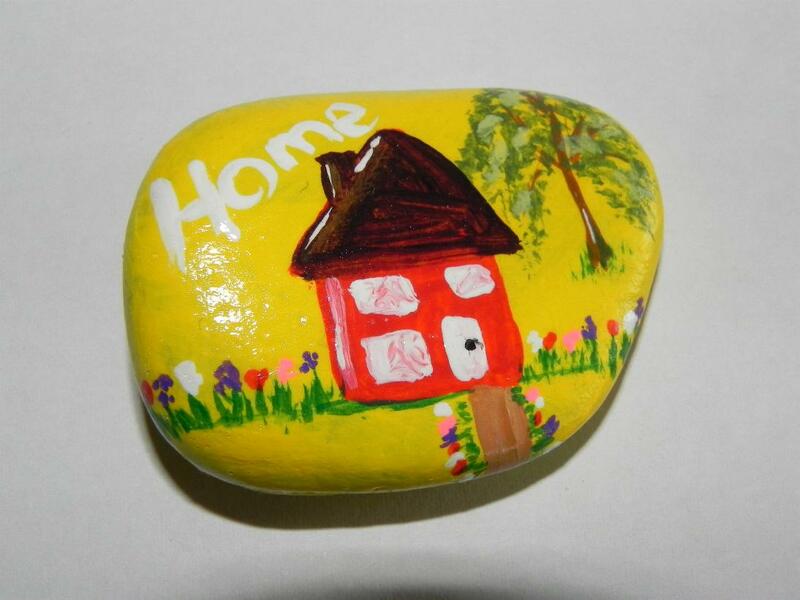 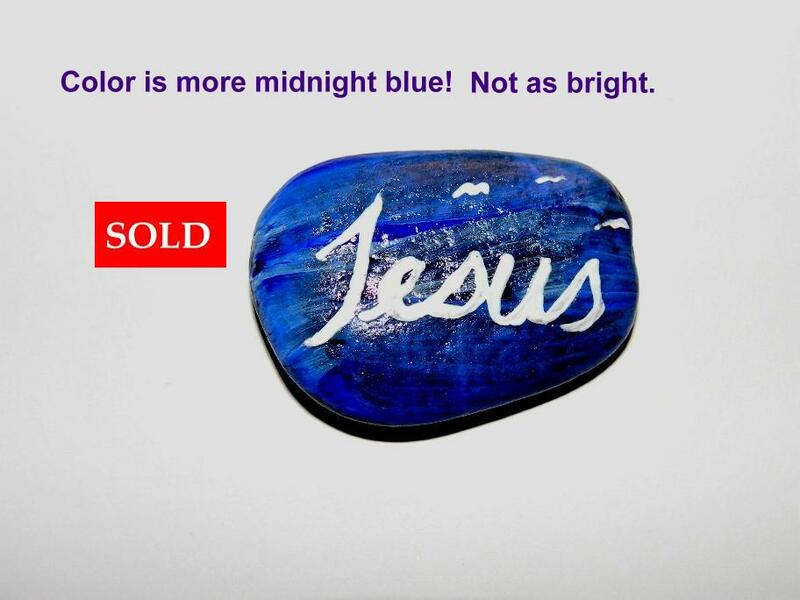 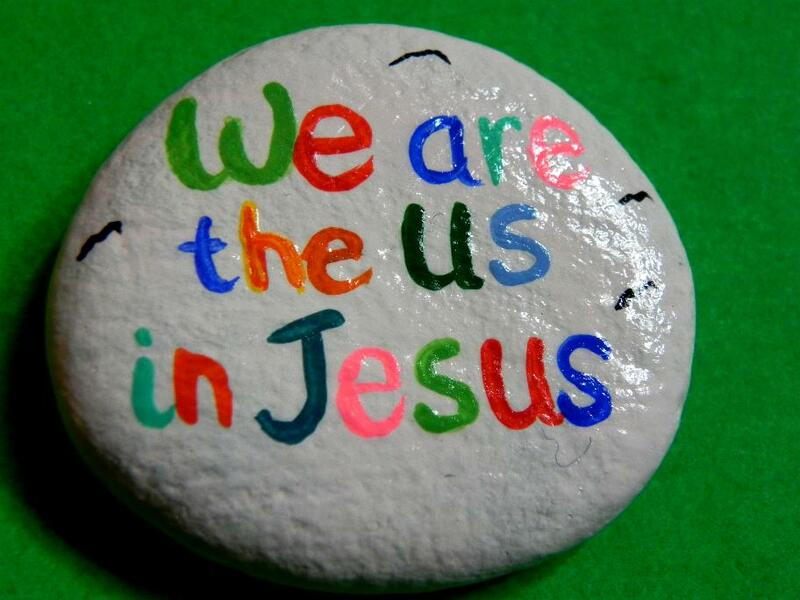 Sponsor a prayer stone for someone who is homeless. 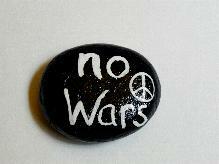 I live near Colorado Springs, CO which has quite a large homeless population, many of whom are war veterans. I will make and distribute any amount of prayer stones you might wish to order. 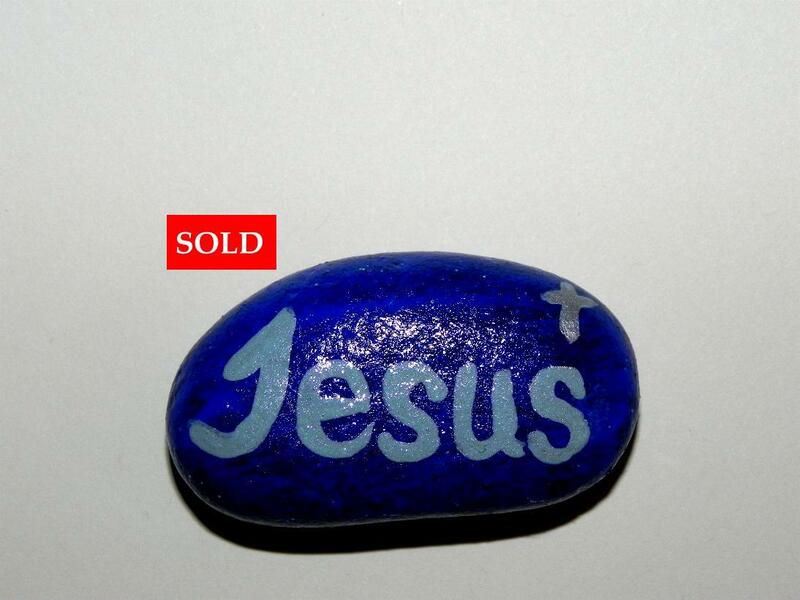 $3 per stone. I make them and set them free! Thank you for helping me spread a little comfort to those less fortunate. 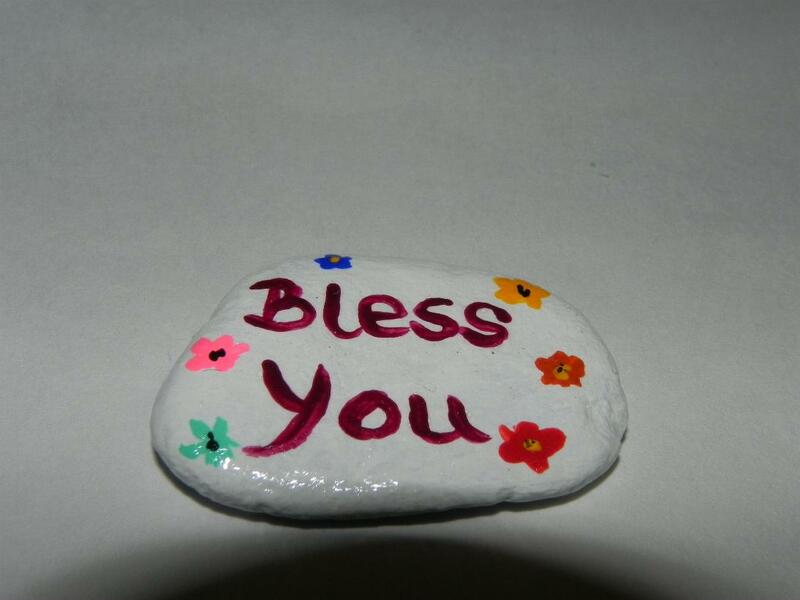 On my travels I have handed out around 20 prayer stones so far, and I will continue to do so, with your help, so your stone could end up anywhere!